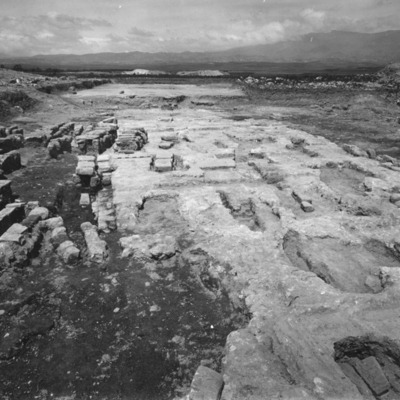 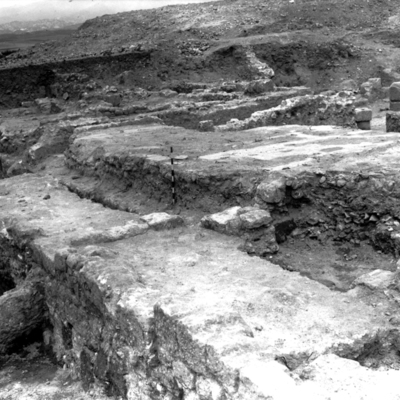 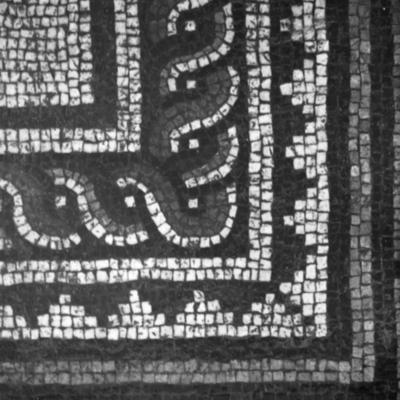 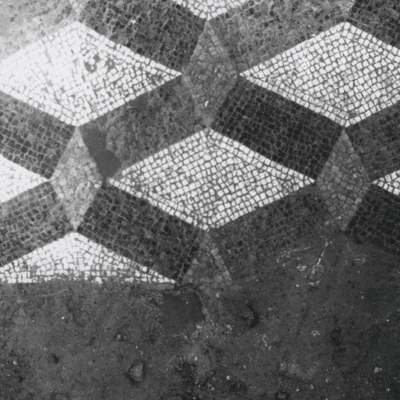 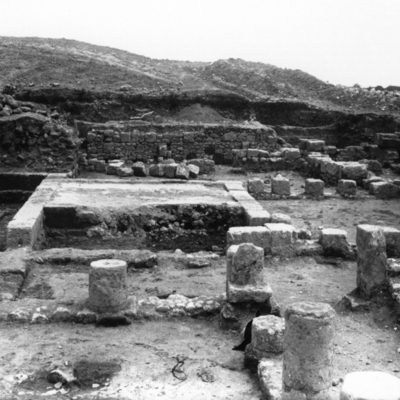 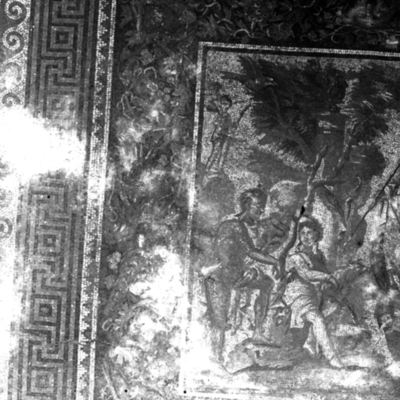 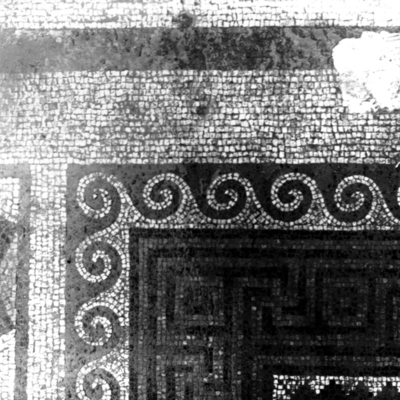 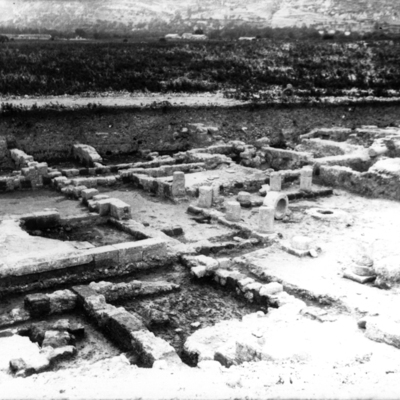 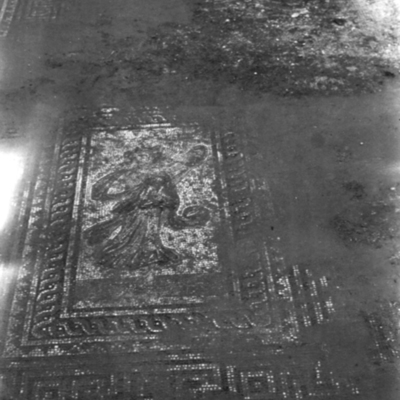 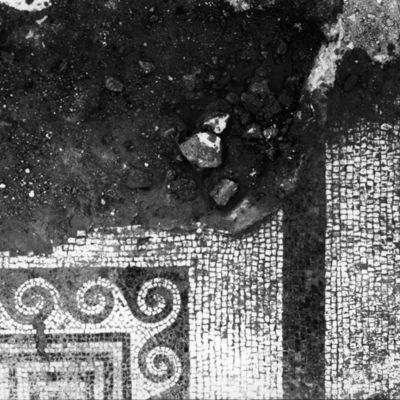 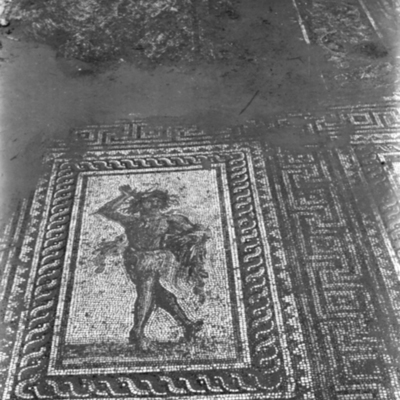 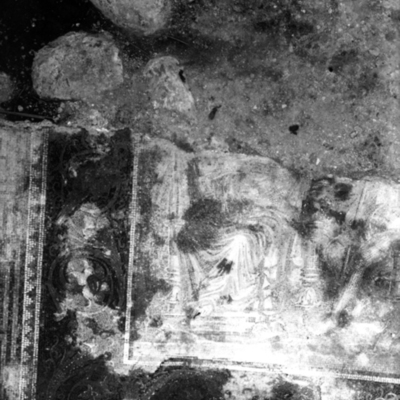 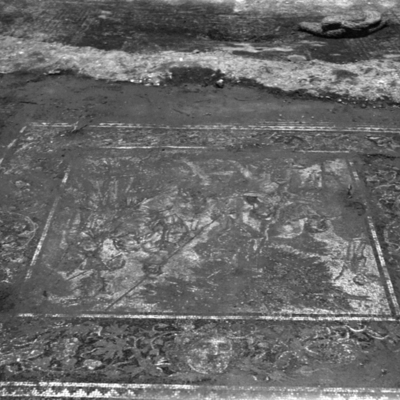 Coverage is exactly "Atrium House (Roman Villa)"
Floor of the triclinium being cleared. 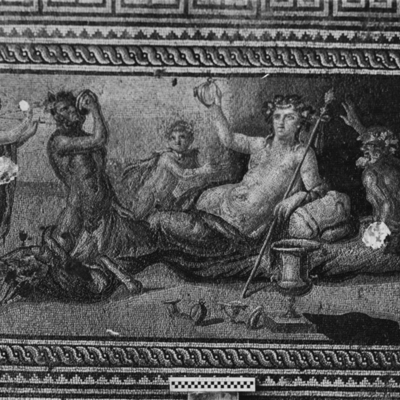 Detail of drinking contest panel. 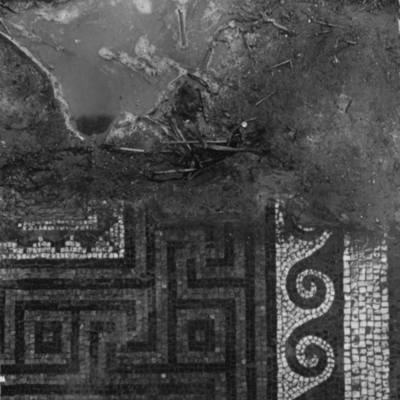 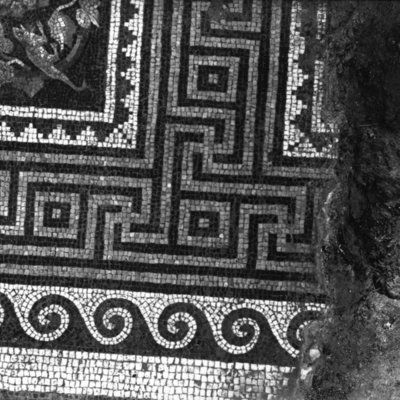 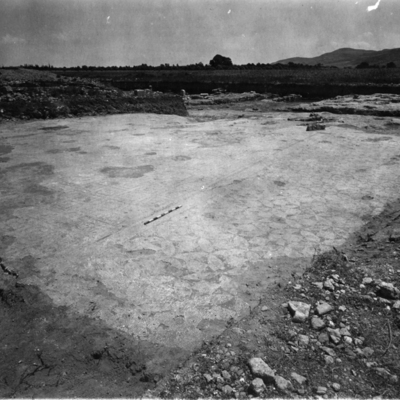 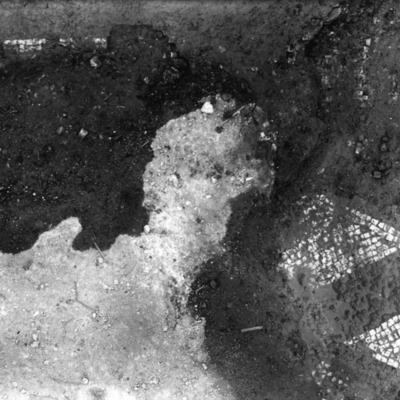 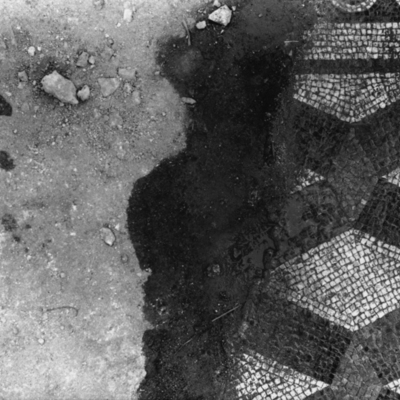 Area southwest of the Atrium House mosaic floor west of the street line. 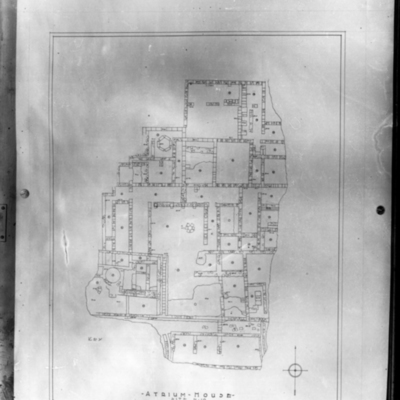 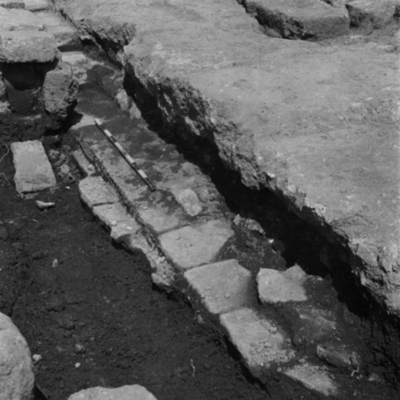 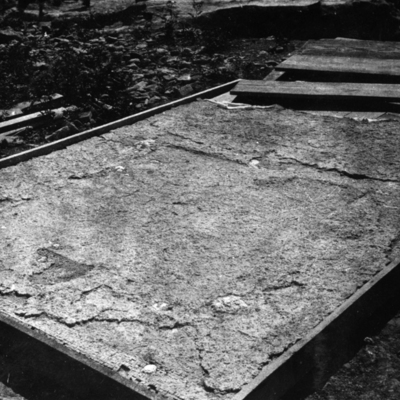 Area southwest of the Atrium House Street with burial over it. 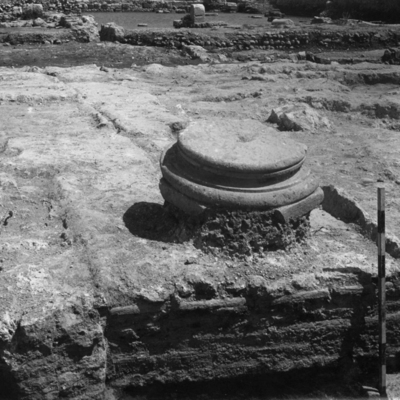 Area southwest of the Atrium House column base on street. 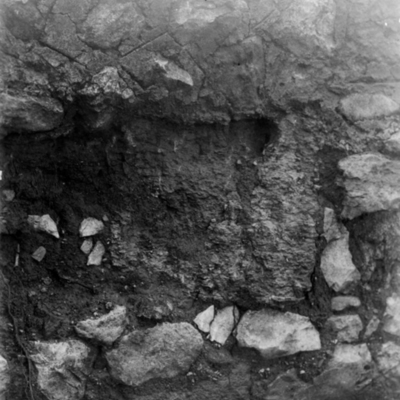 Area southwest of the Atrium House brick facing wall on street. 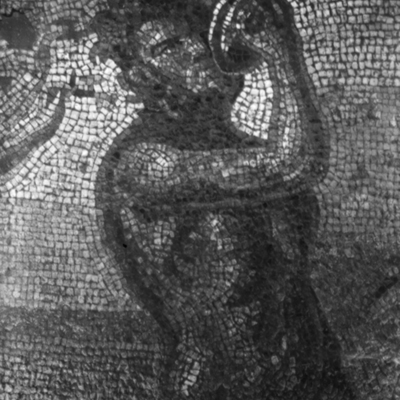 Raised mosaic panel B the drinking contest. 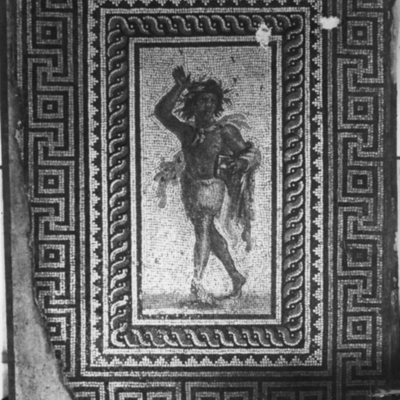 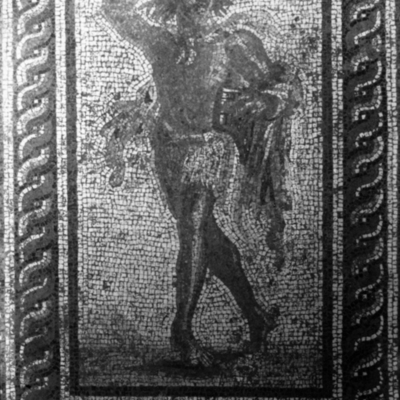 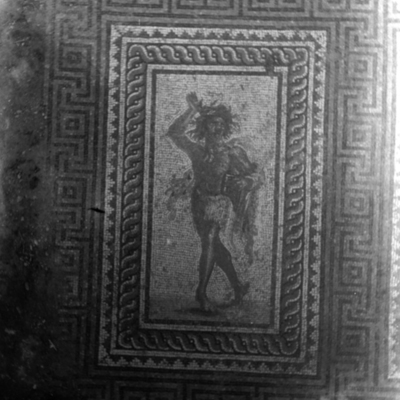 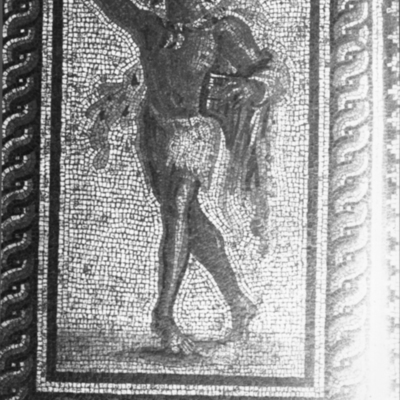 Raised panel A dancing satyr. 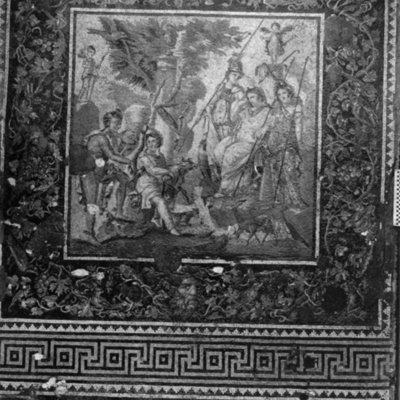 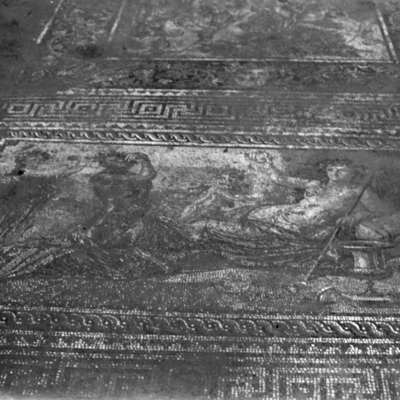 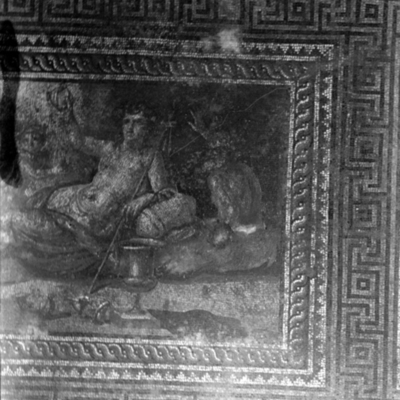 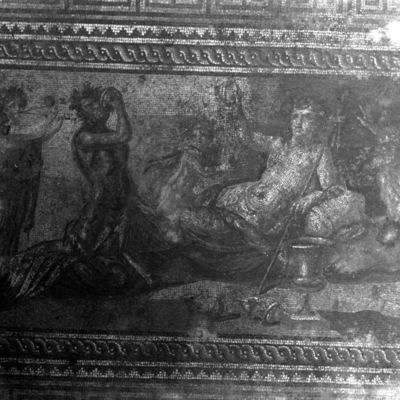 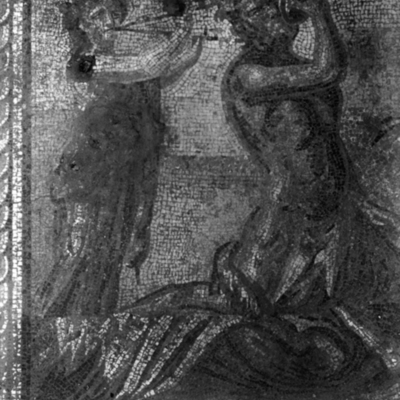 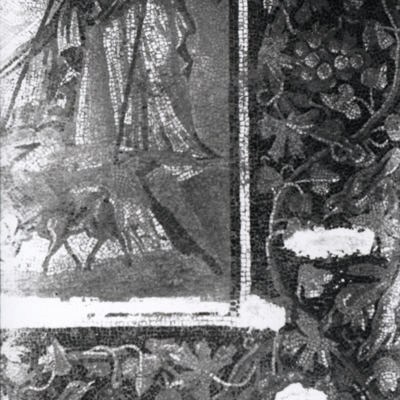 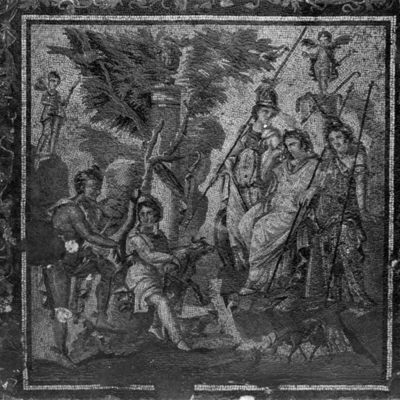 Raised panel E showing Aphrodite and Adonis. 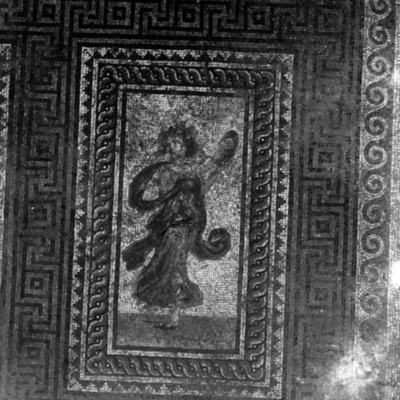 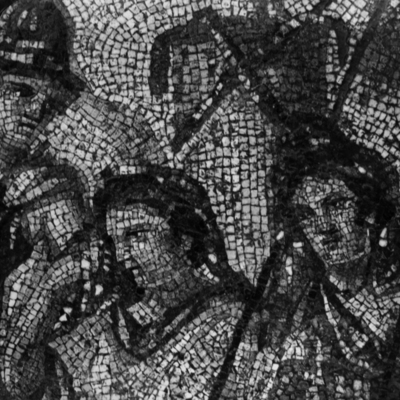 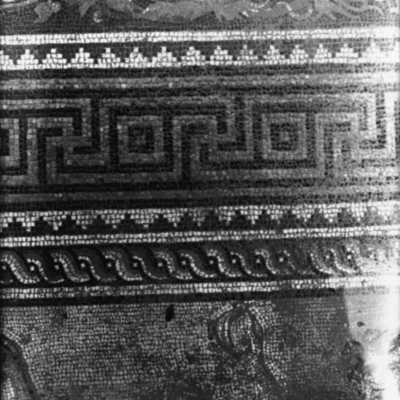 Mosaic panel D raised detail of figures. 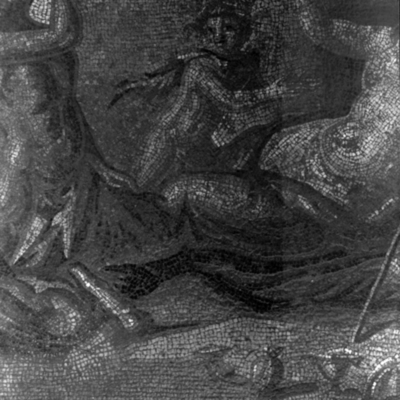 Detail of center mosaic panel: three goddesses. 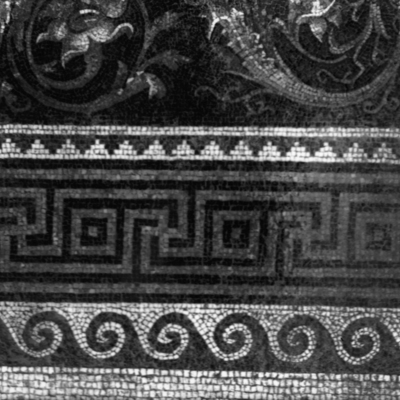 Border detail. 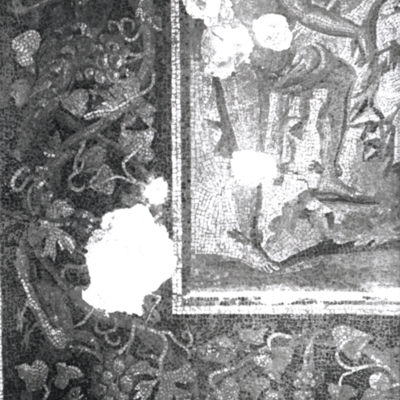 Same as A-11. 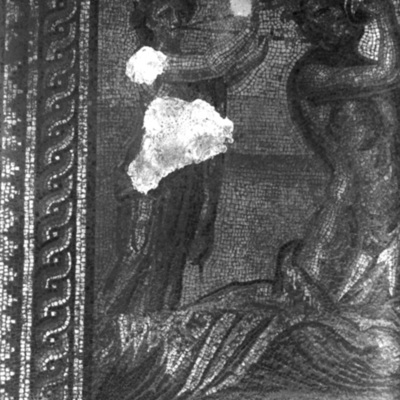 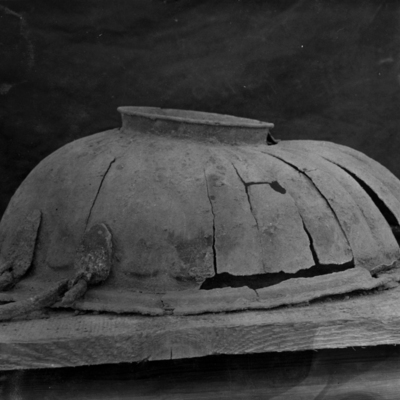 Center of panel showing the figure. 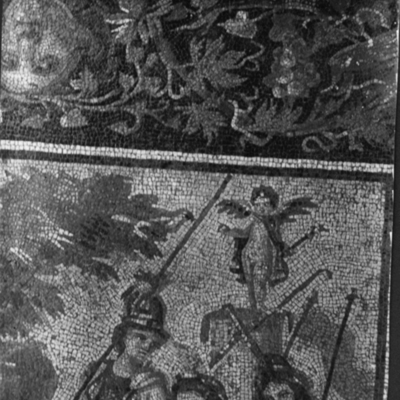 Right side of panel showing figures. 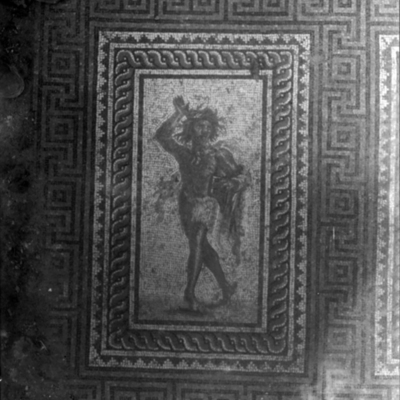 Satyr panel photographed at 1/10 size. 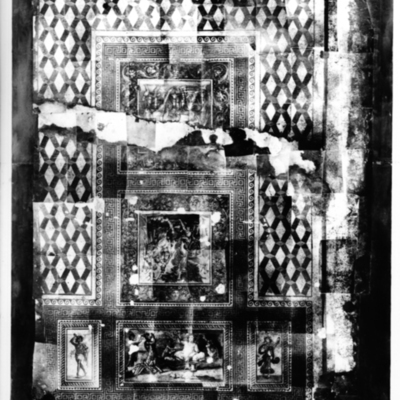 Corners of panels B, C, D.
Border including corners of three panels. 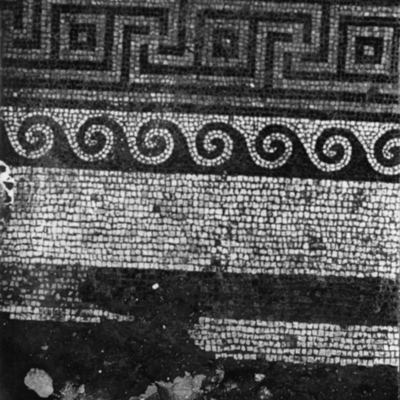 Meander between panels at corners. 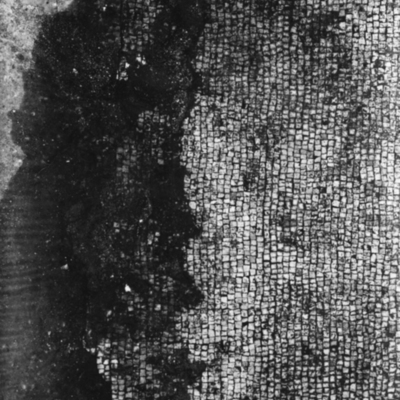 Lower right corner of rinceau. 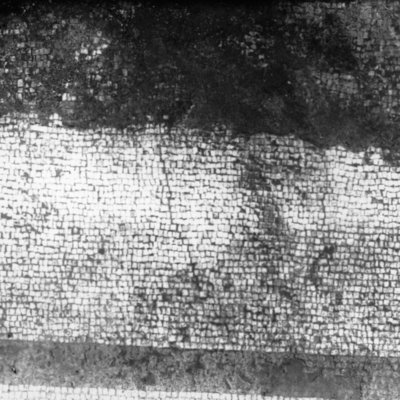 Lower left corner of rinceau. 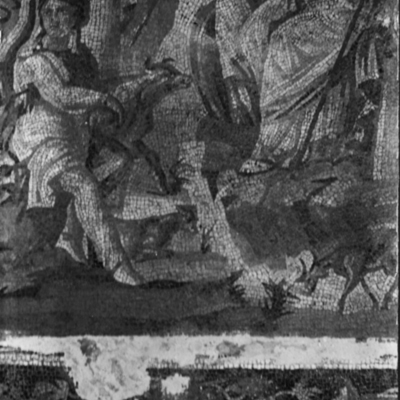 Lower right corner of figures. 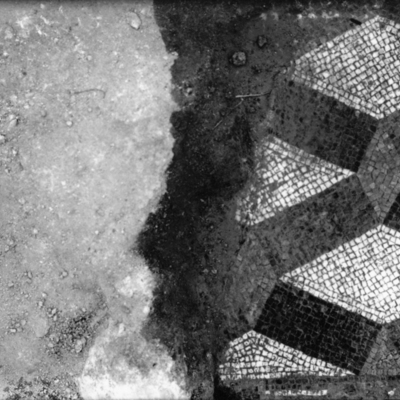 Overhead view of entire mosaic assembled from separate photos. 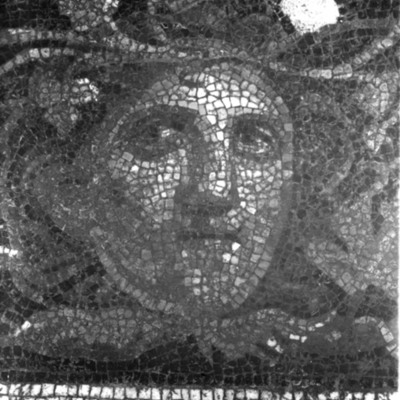 Heads of the three goddesses and border with mask. 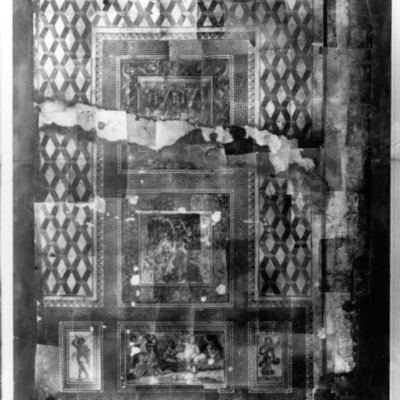 Entire panel with border 1/10th size. 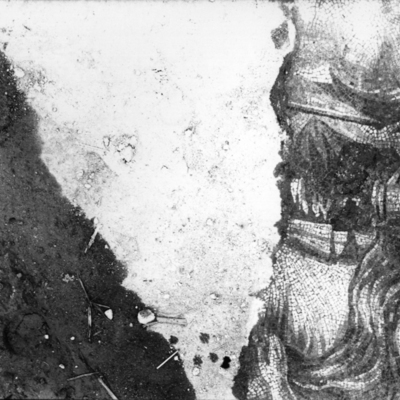 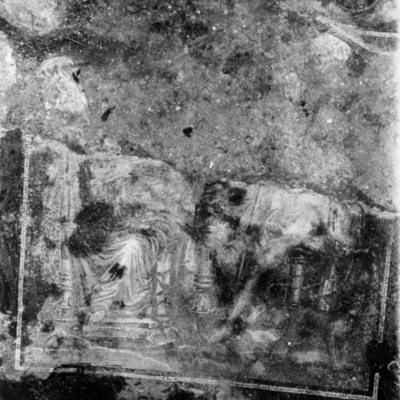 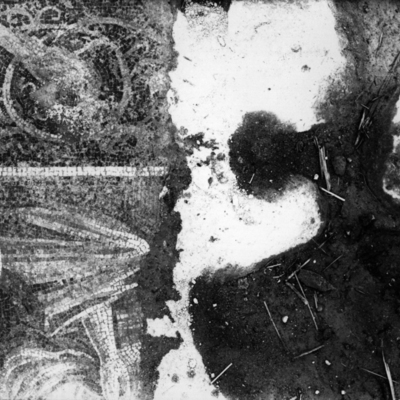 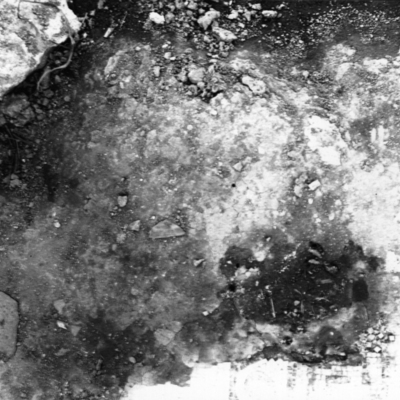 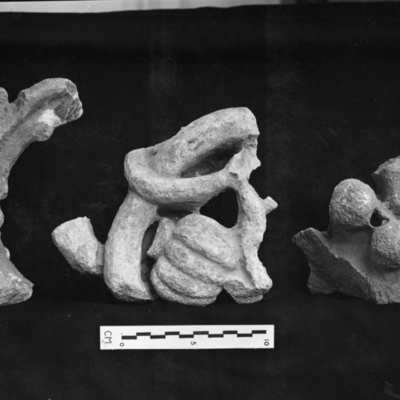 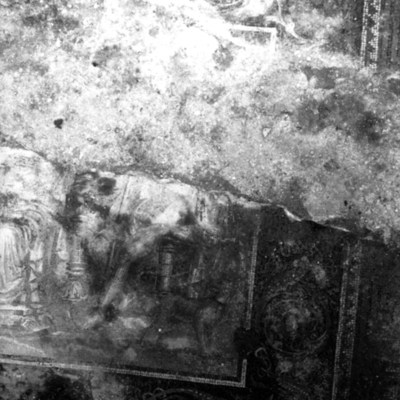 Lower left corner of figures and fragmented area. 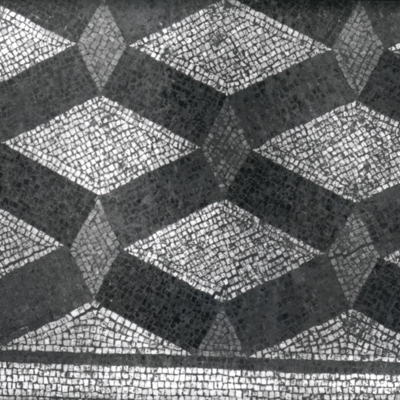 Almost entire panel 1/5th size. 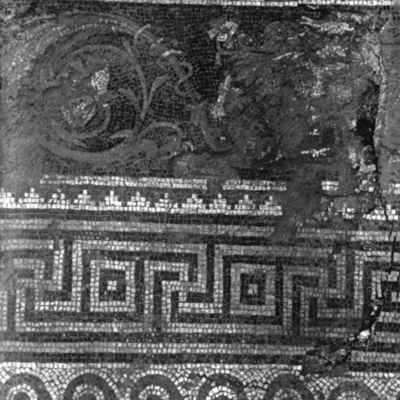 Right half of figures and border. 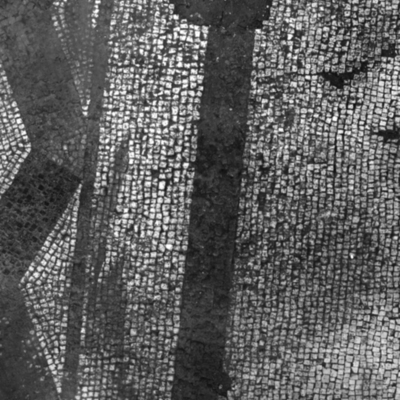 Detail of leg male figure. 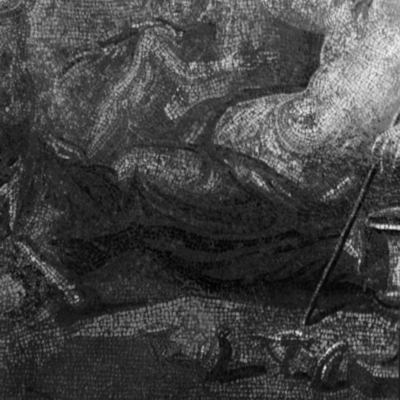 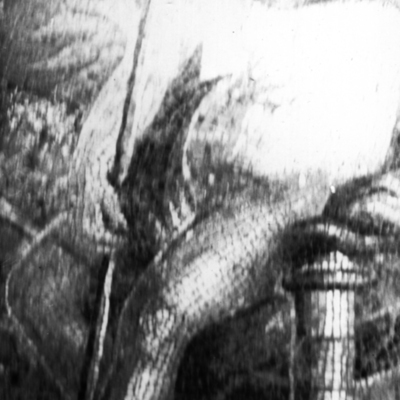 Detail of rinceau showing grasshopper. 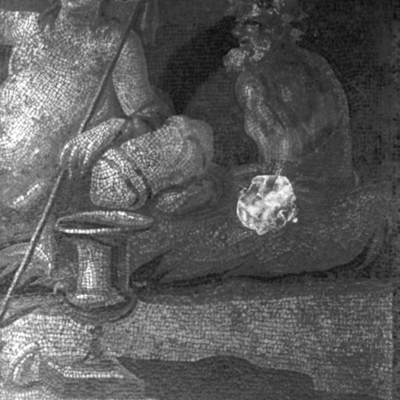 Heads of Hermes and Paris. 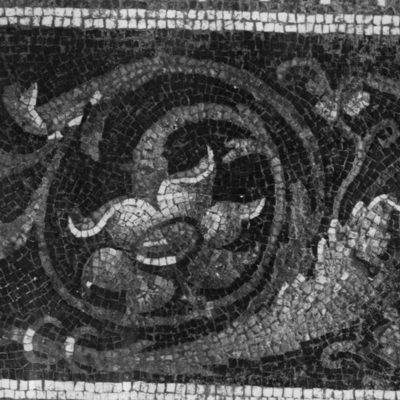 Detail of mask in rinceau. 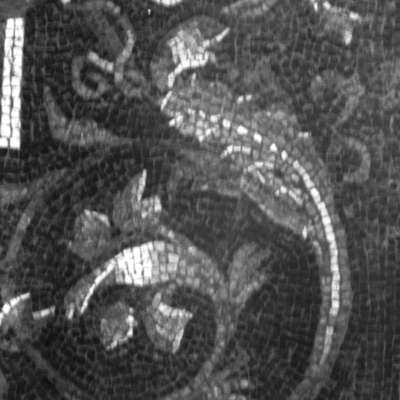 Detail of grasshopper in rinceau. 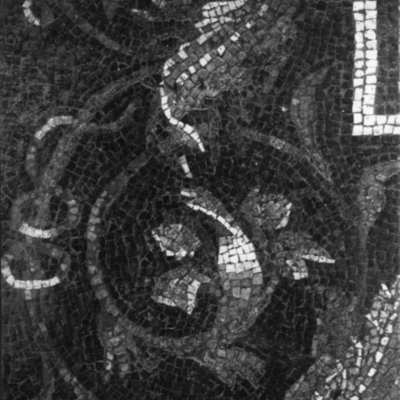 Detail of flower in rinceau. 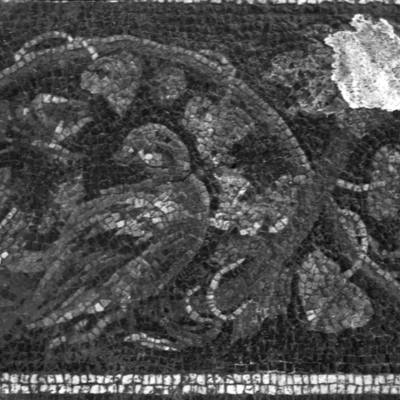 Detail of bird in rinceau. 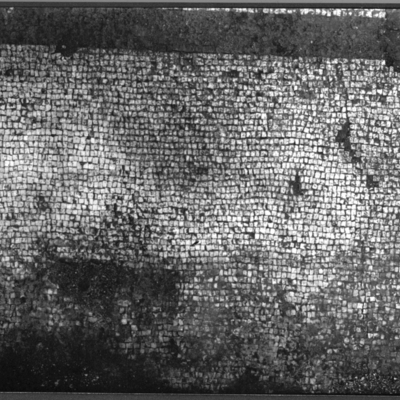 Photo at 1/10 scale right half of panel. 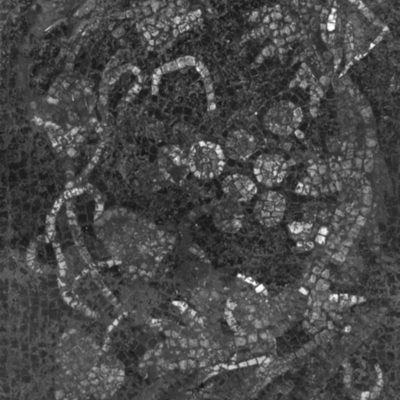 Photo at 1/10 scale left half of panel. 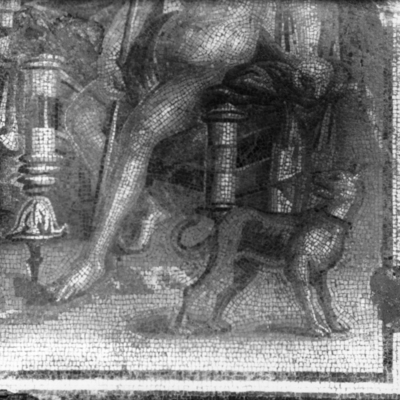 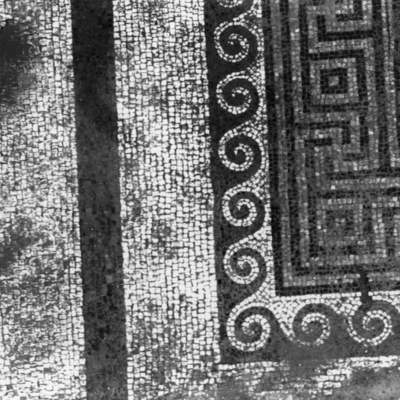 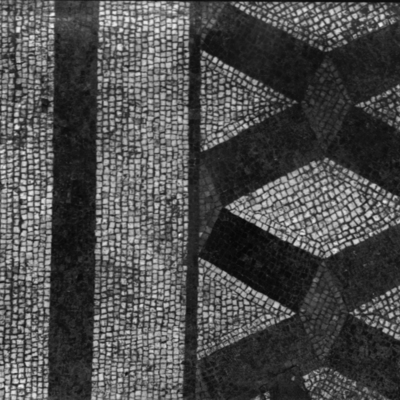 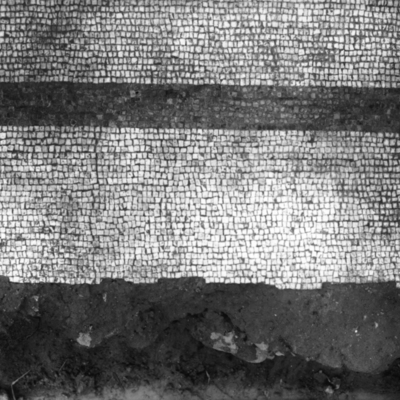 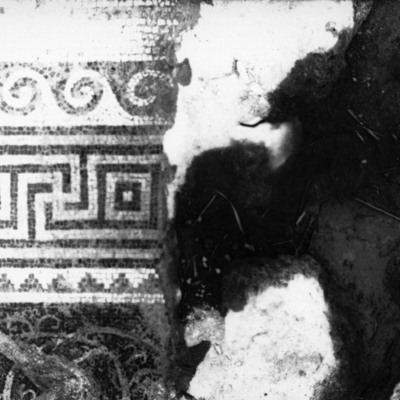 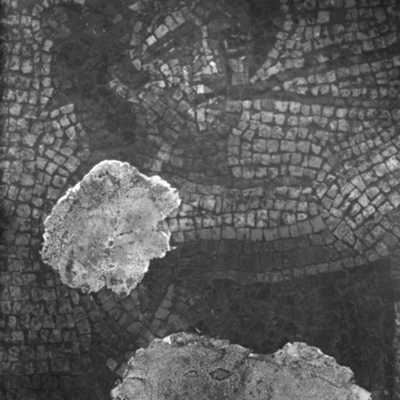 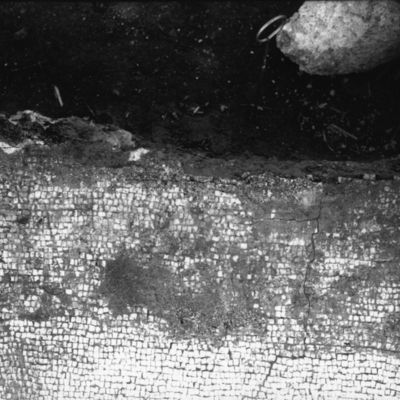 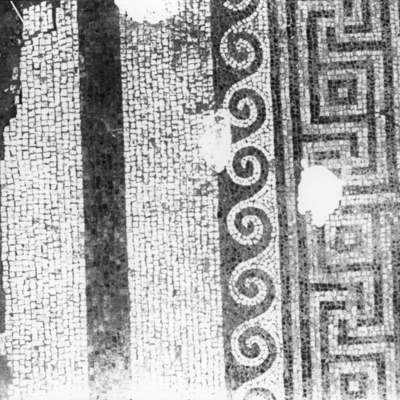 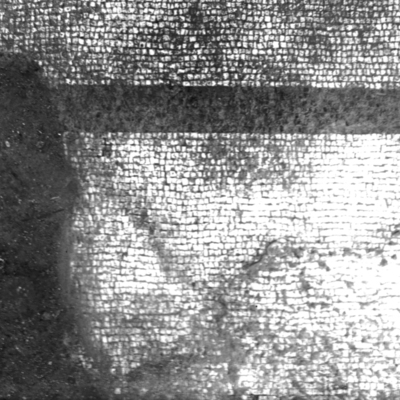 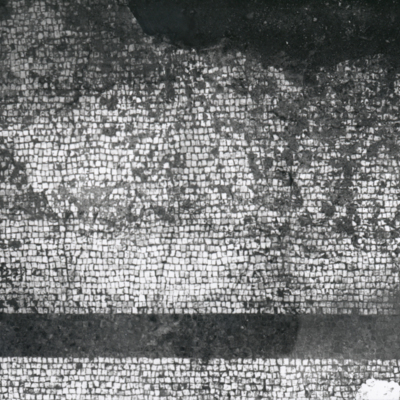 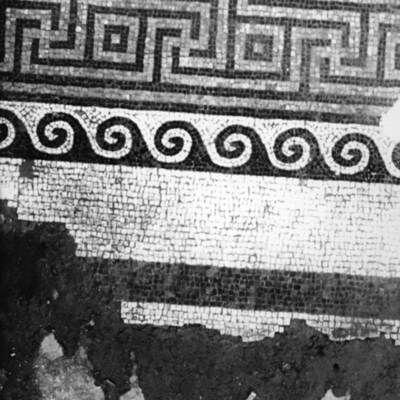 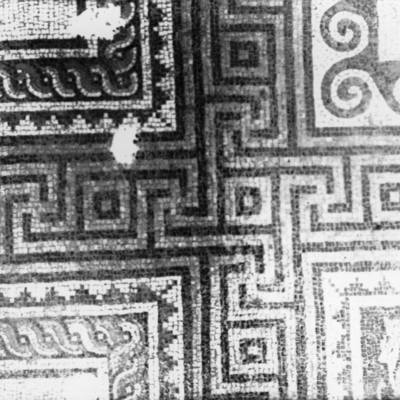 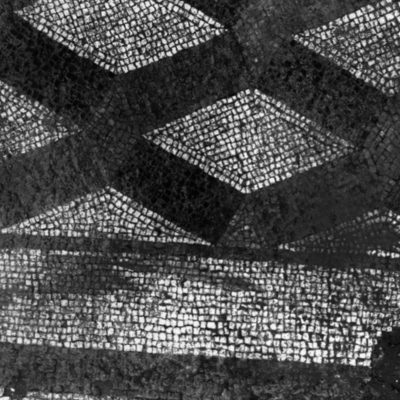 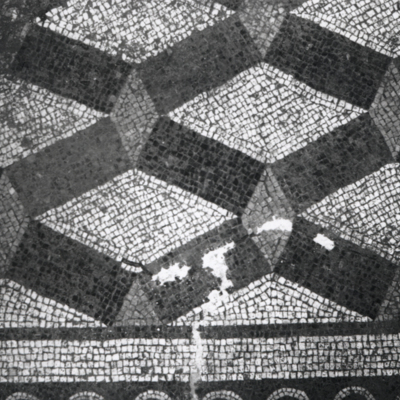 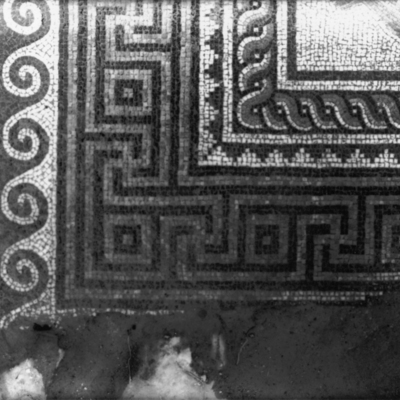 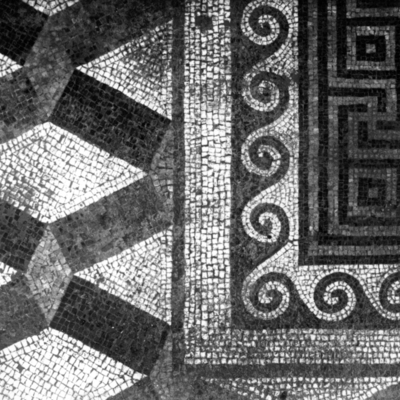 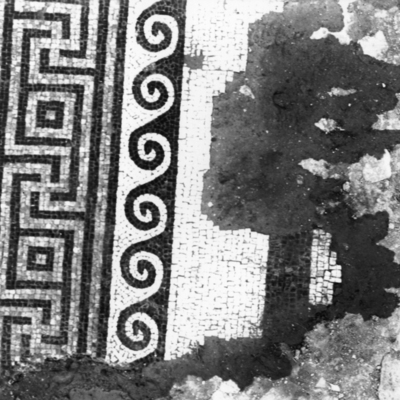 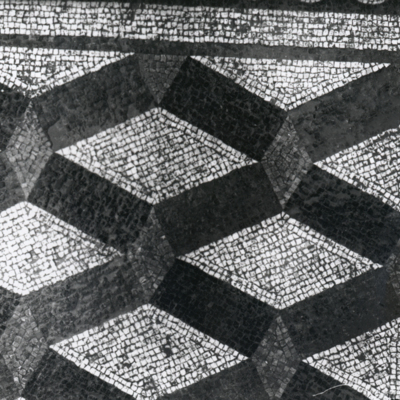 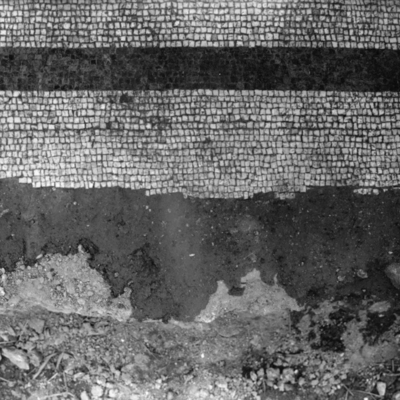 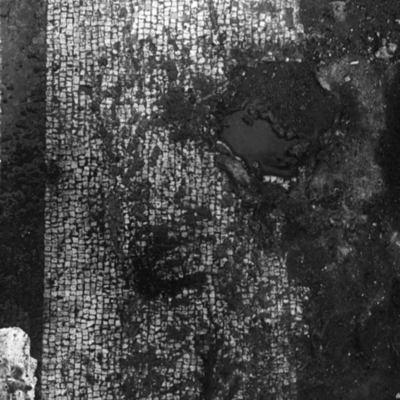 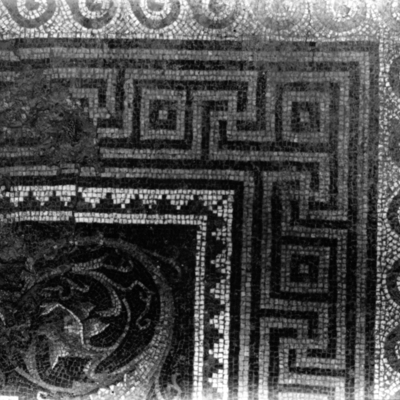 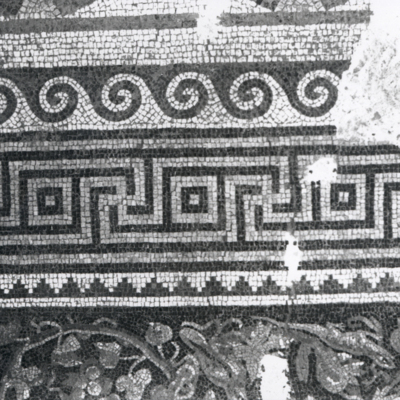 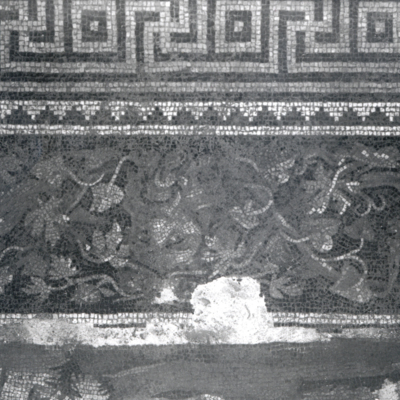 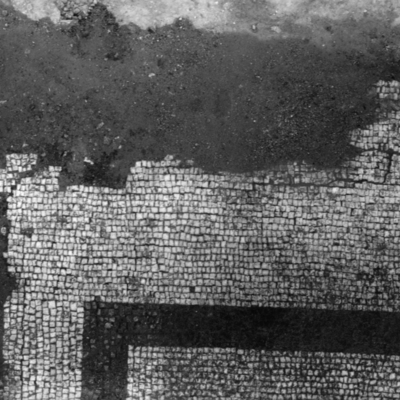 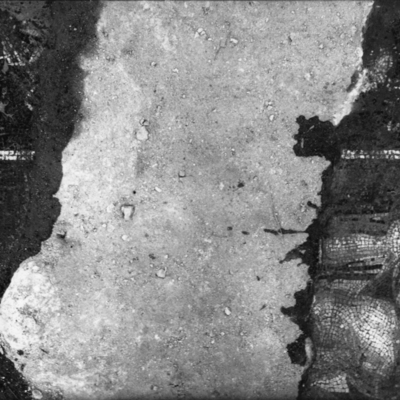 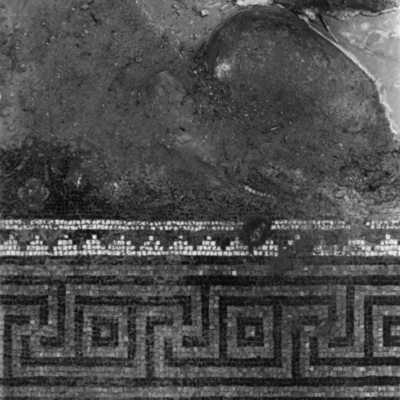 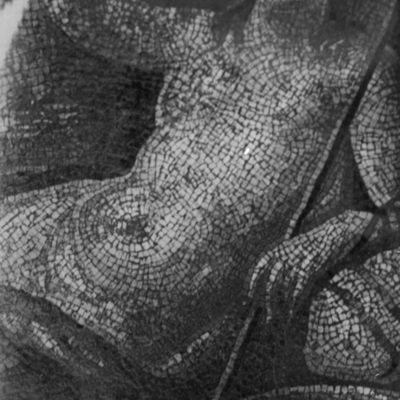 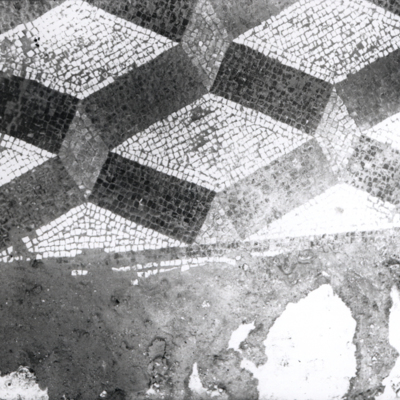 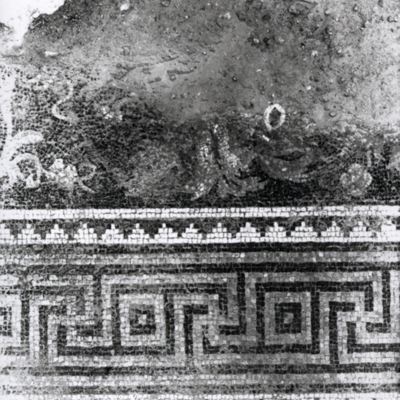 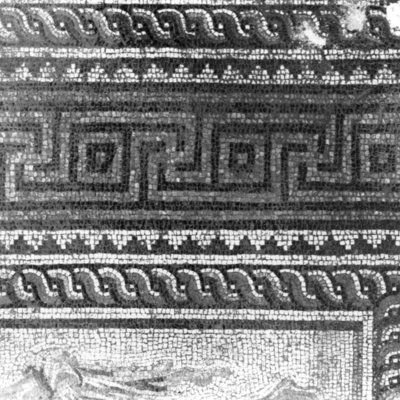 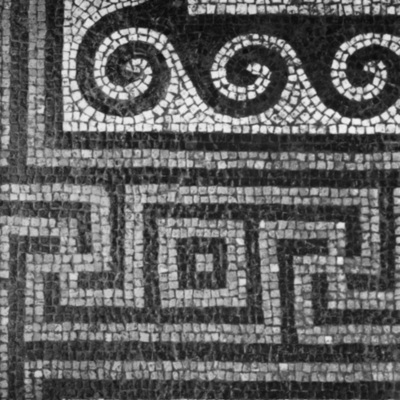 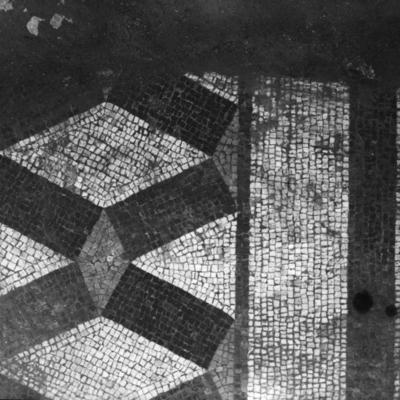 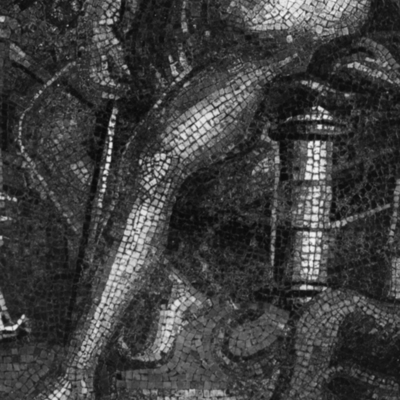 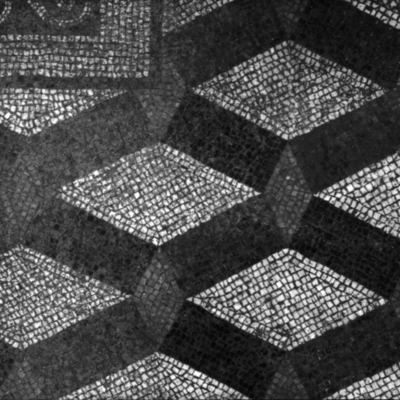 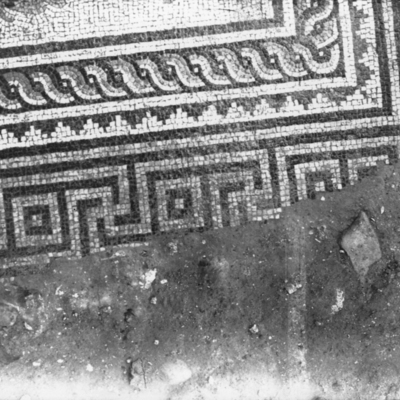 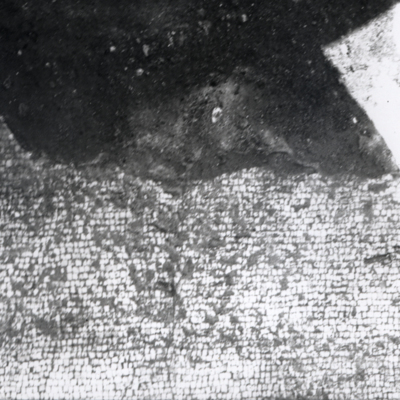 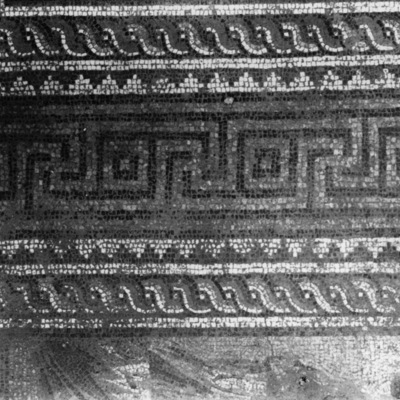 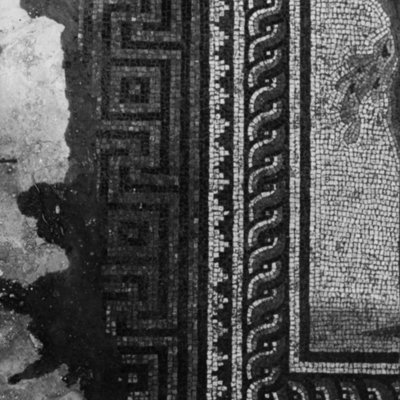 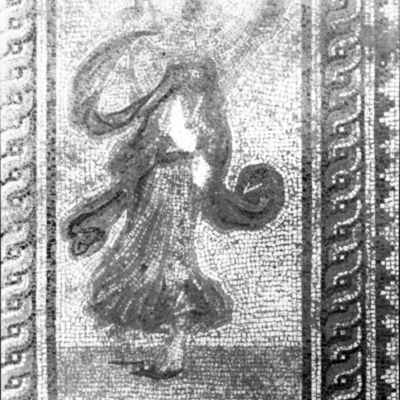 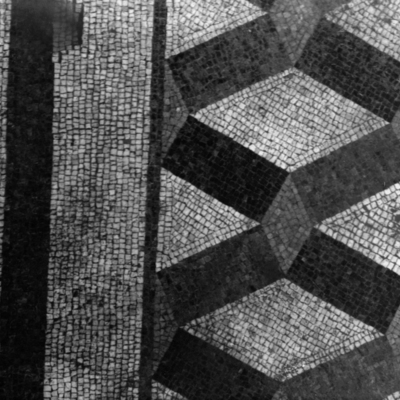 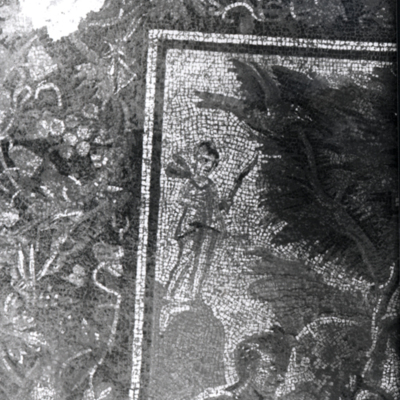 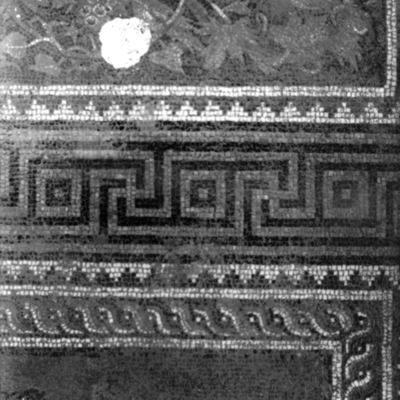 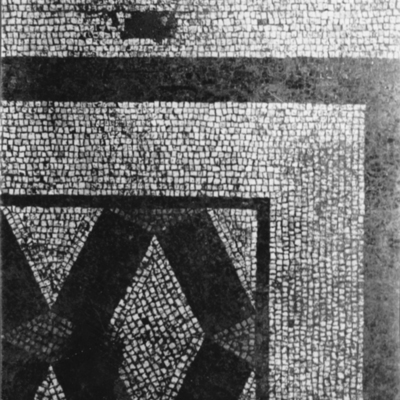 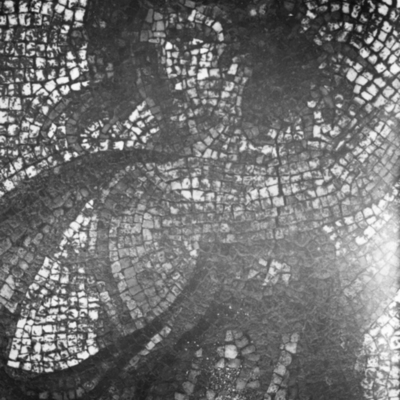 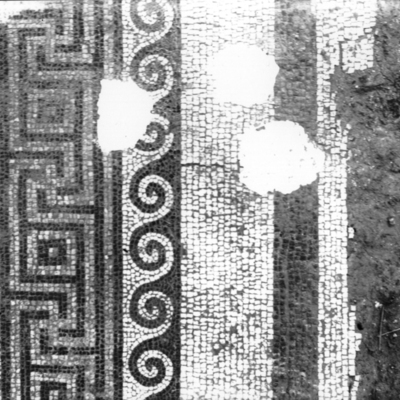 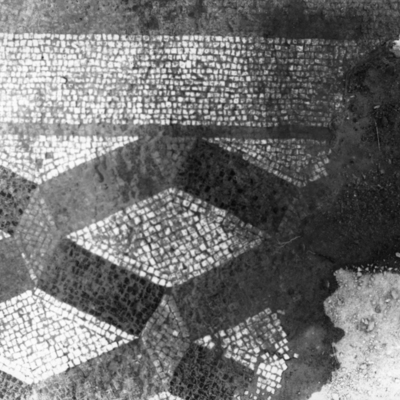 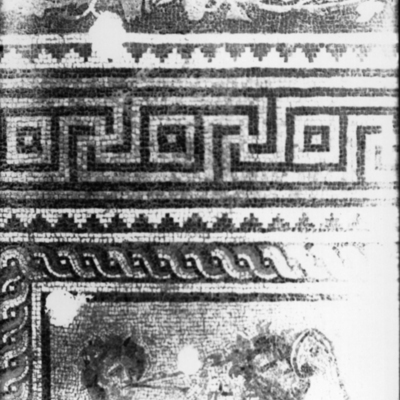 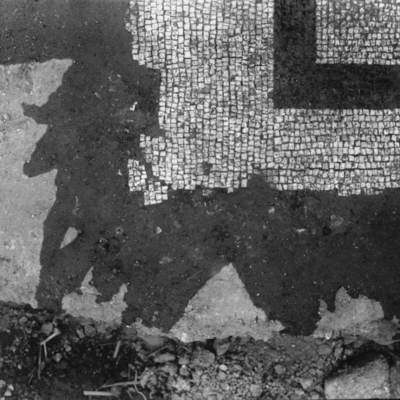 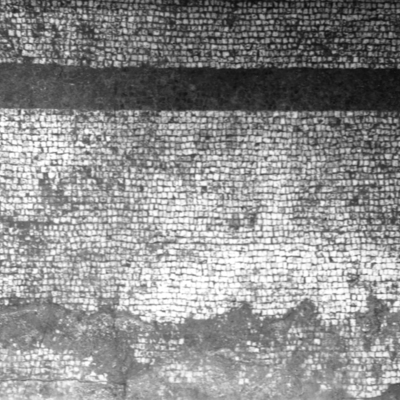 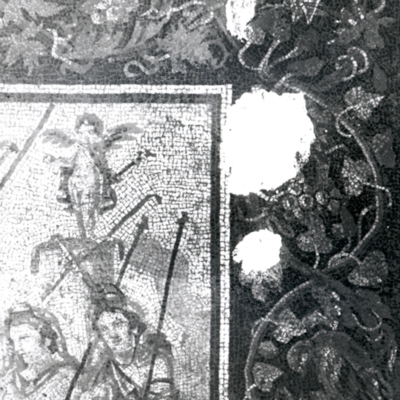 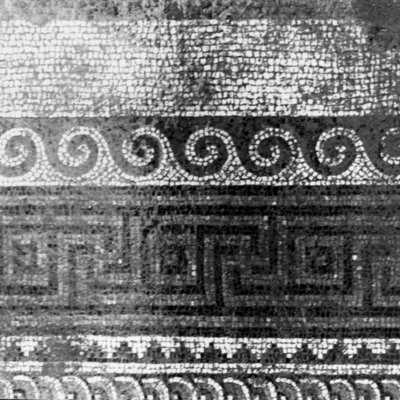 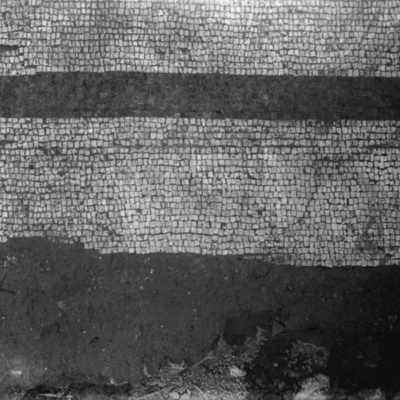 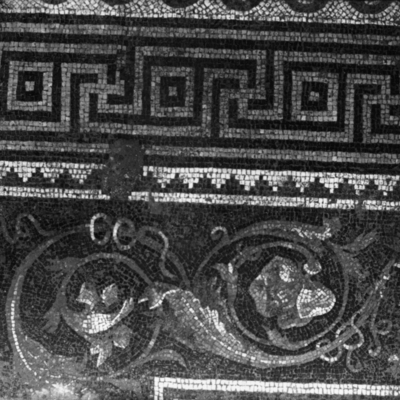 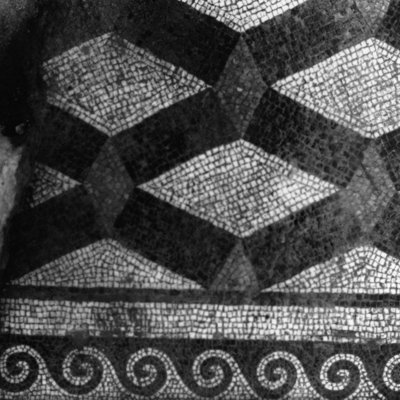 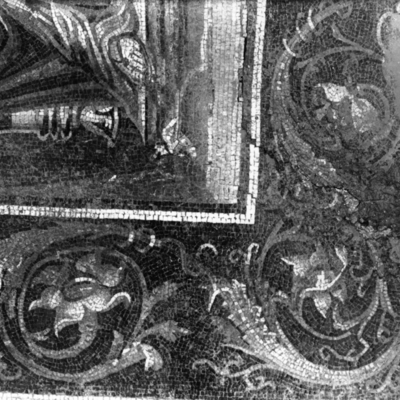 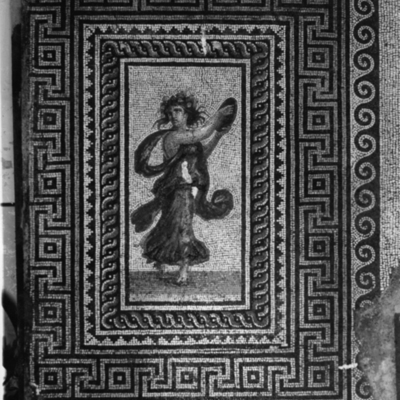 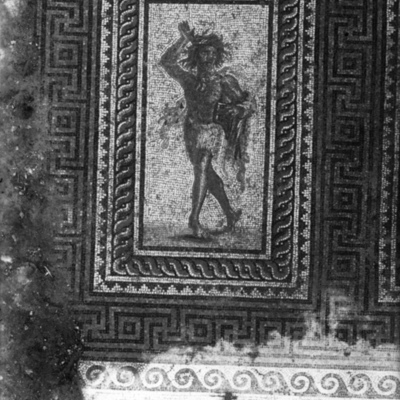 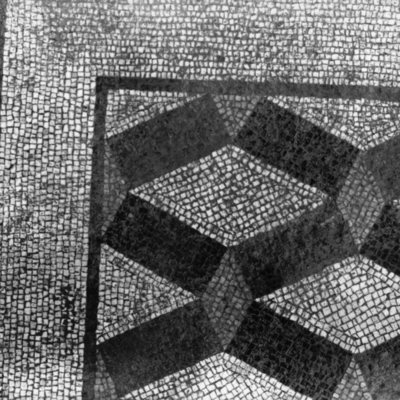 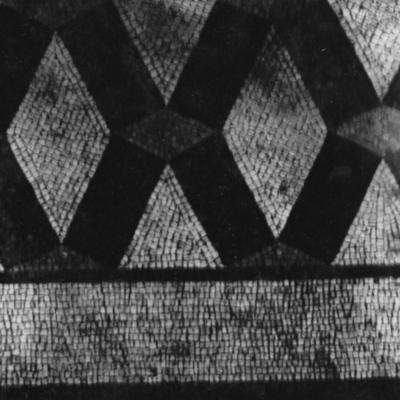 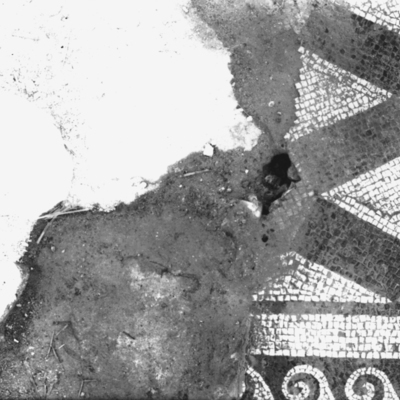 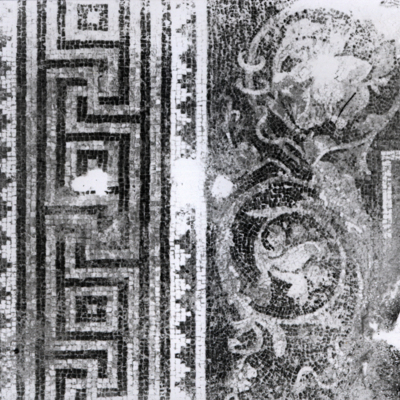 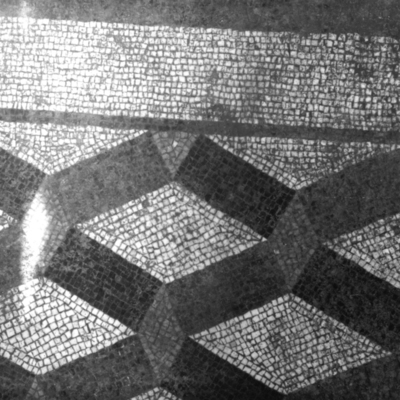 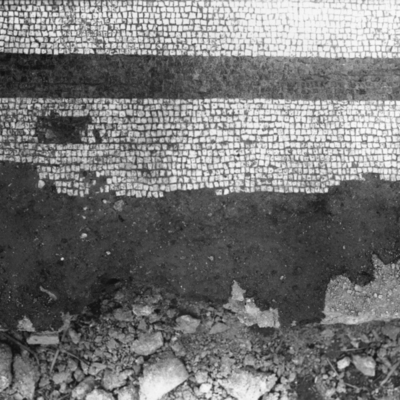 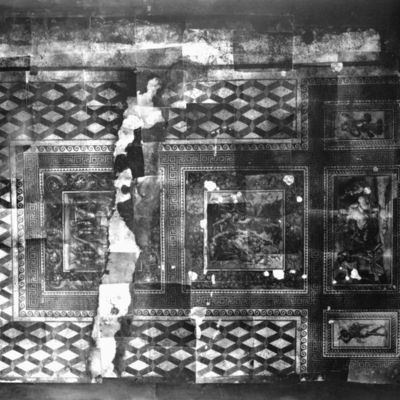 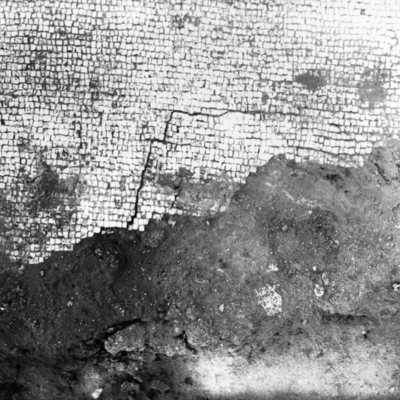 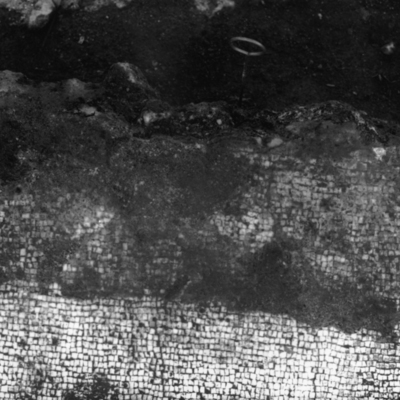 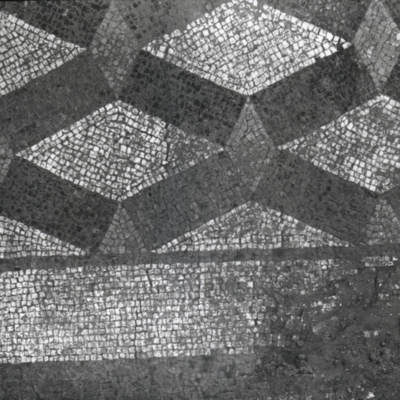 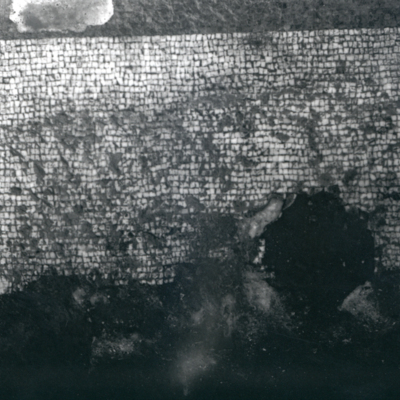 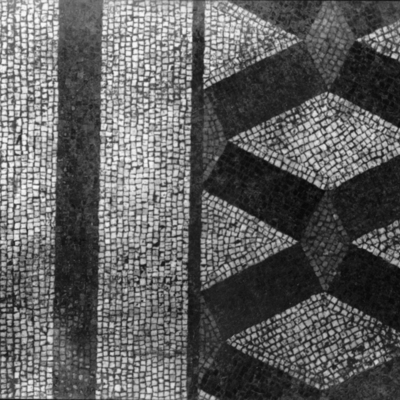 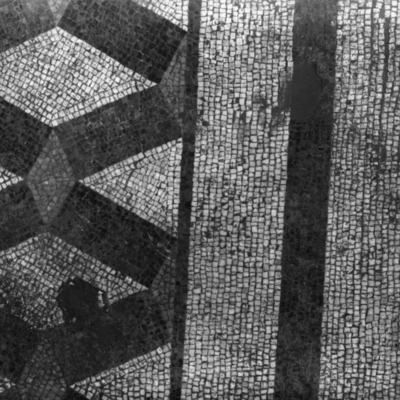 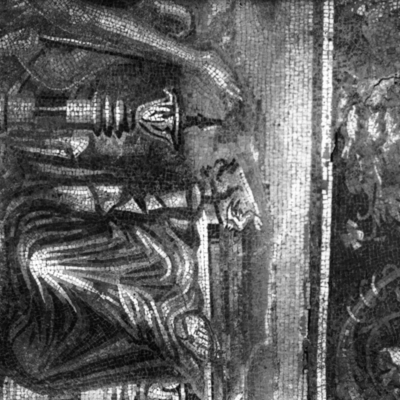 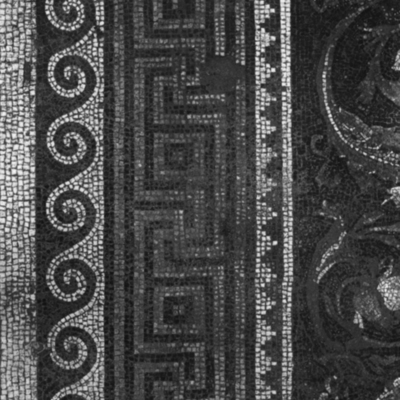 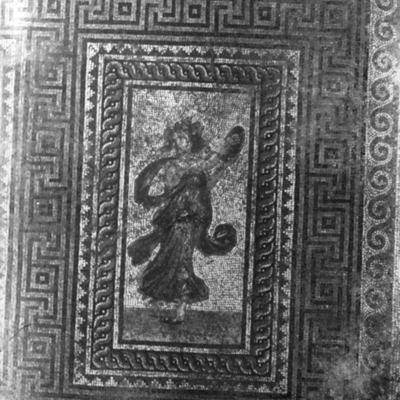 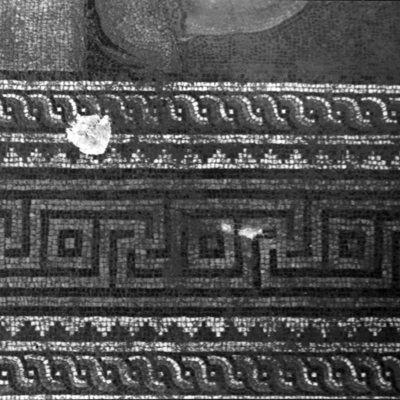 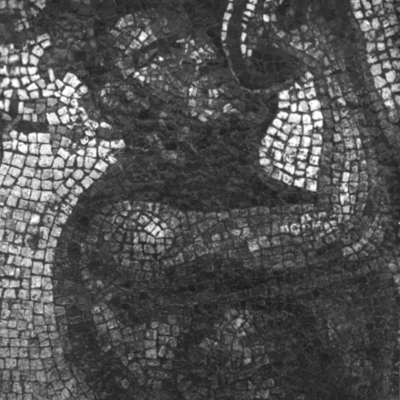 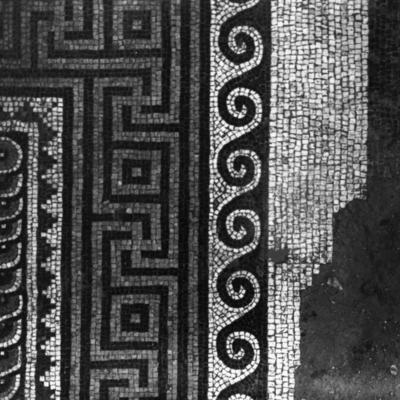 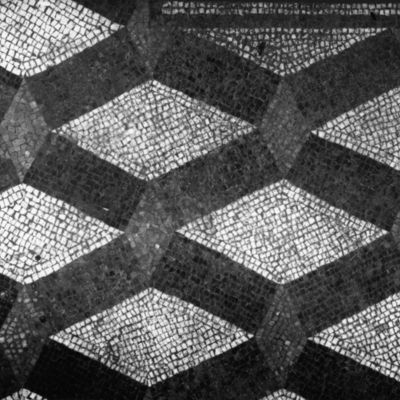 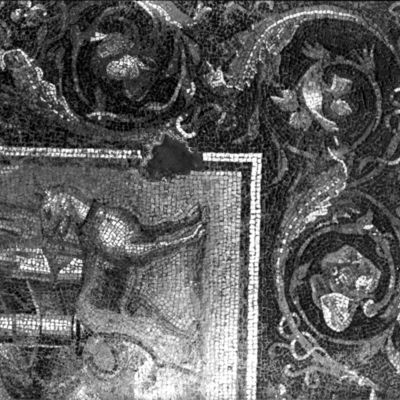 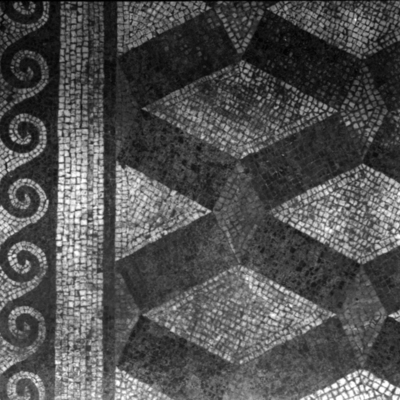 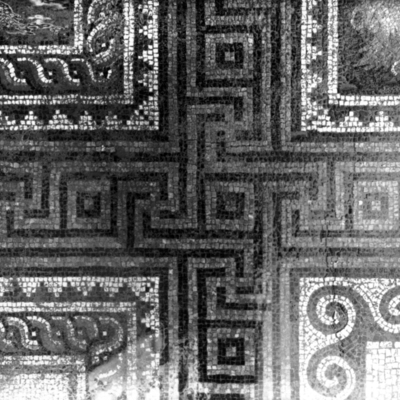 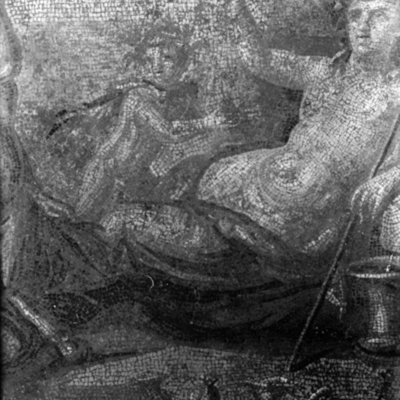 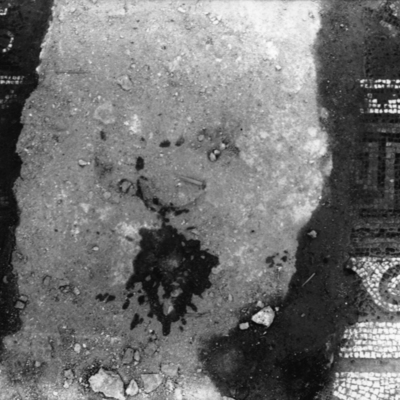 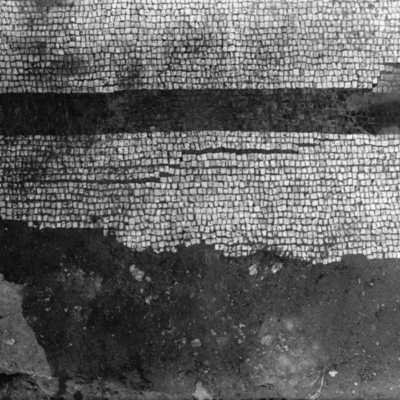 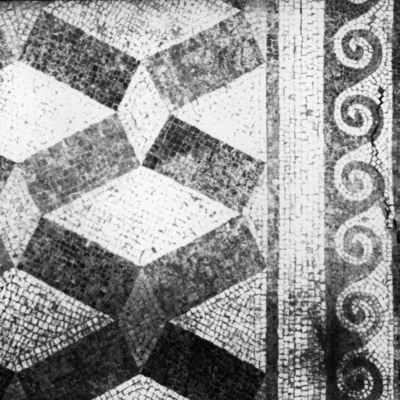 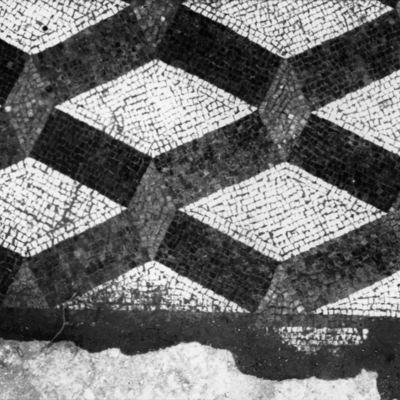 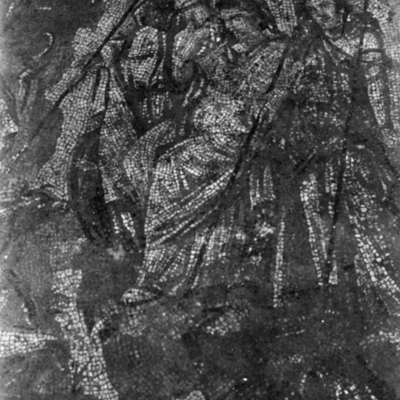 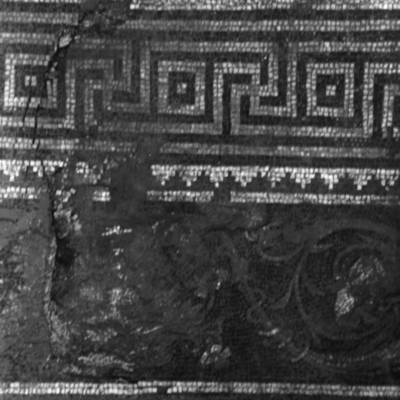 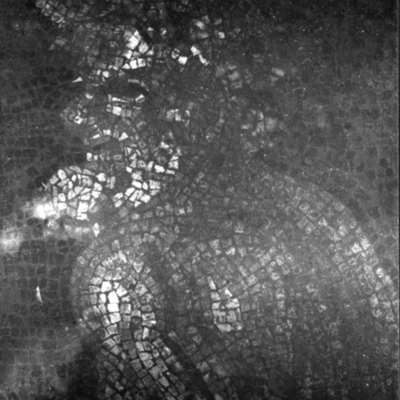 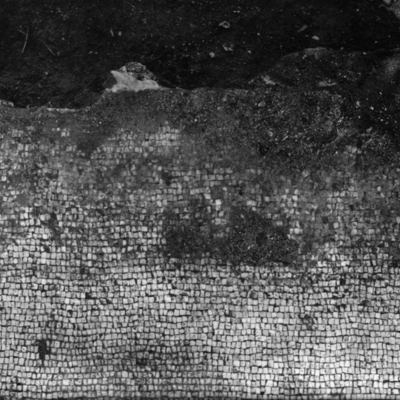 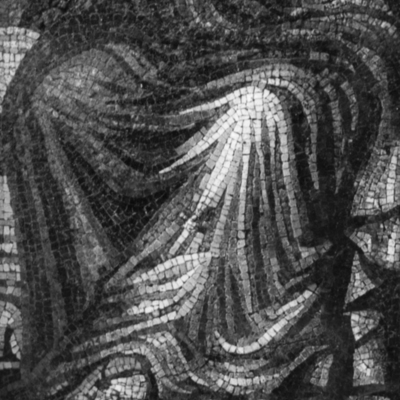 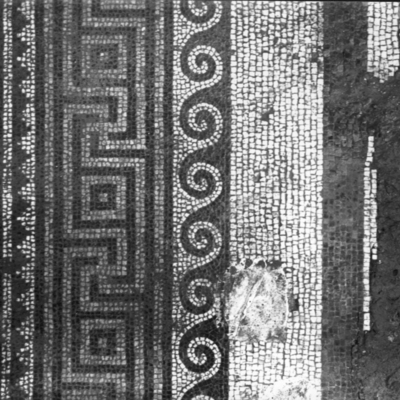 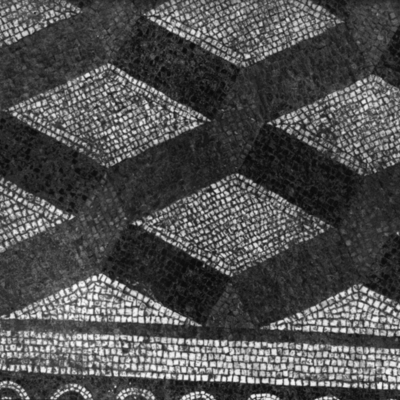 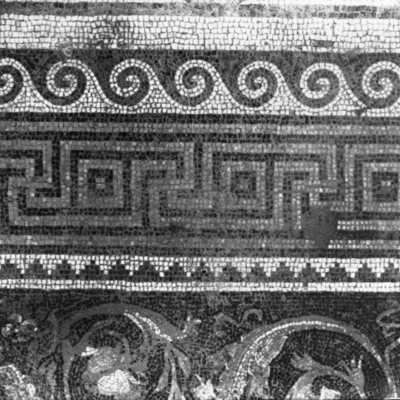 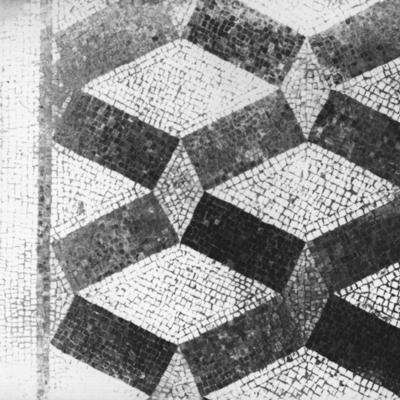 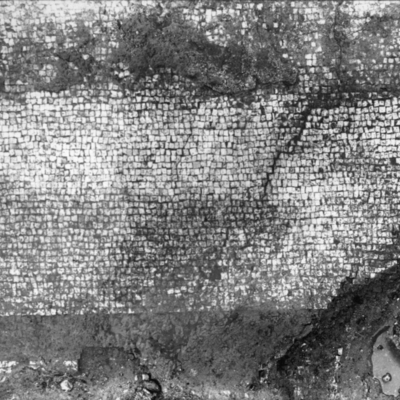 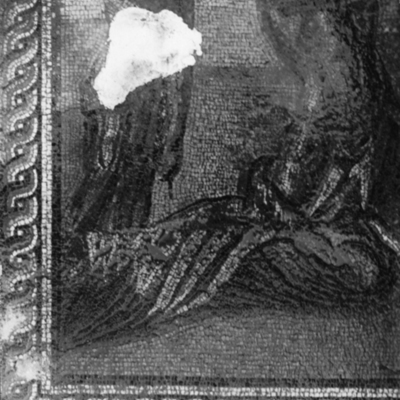 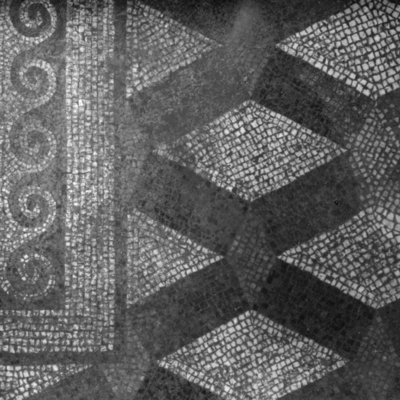 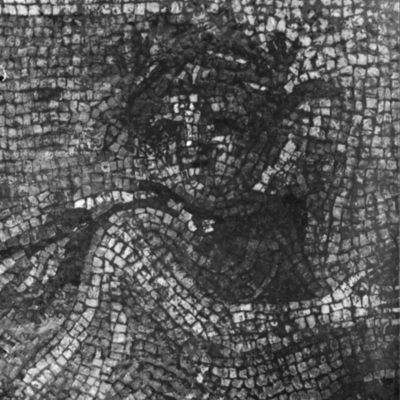 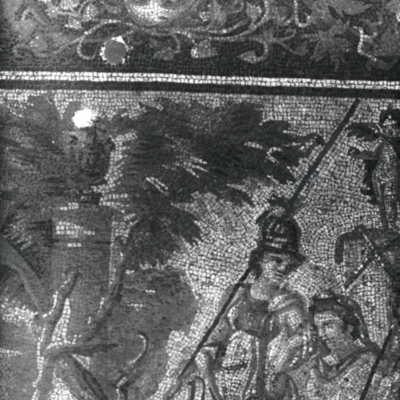 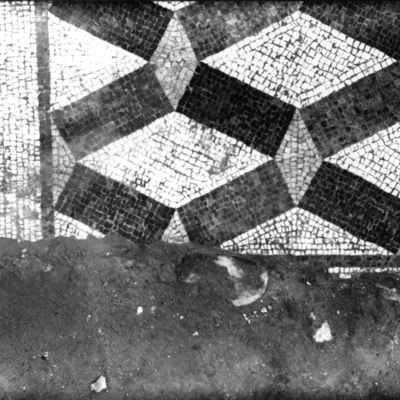 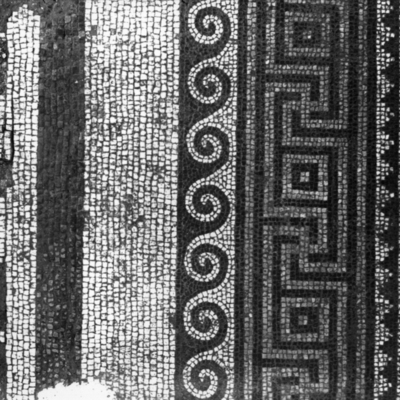 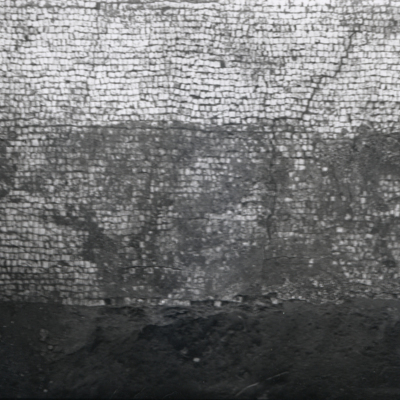 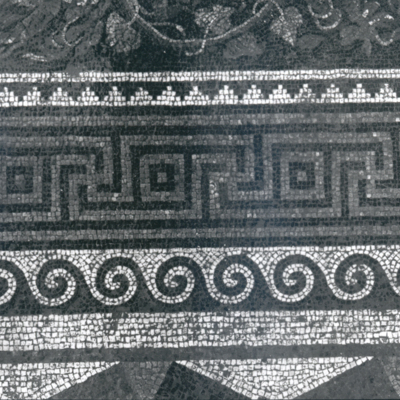 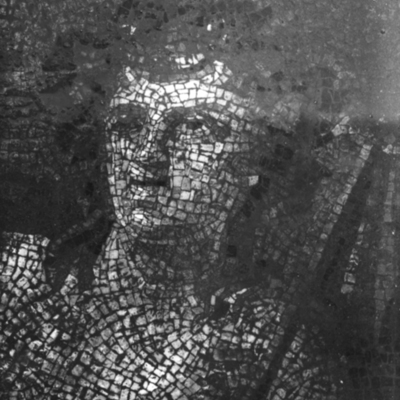 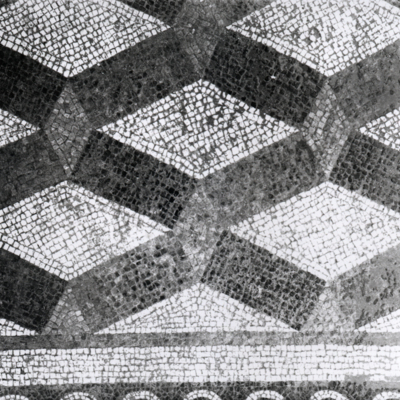 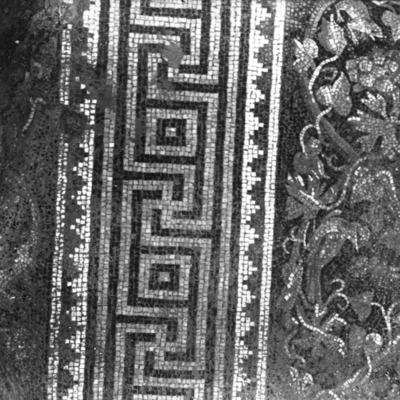 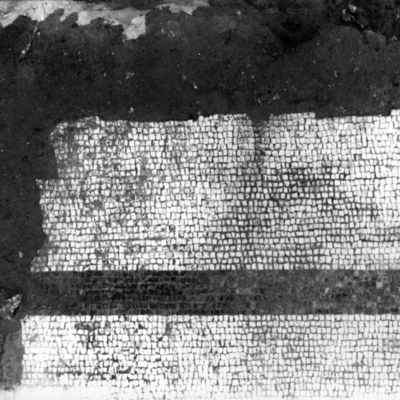 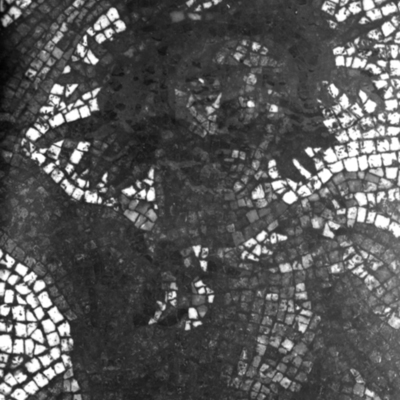 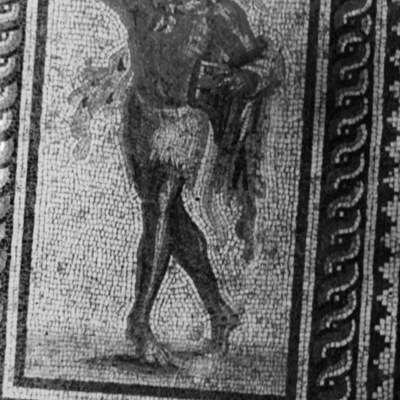 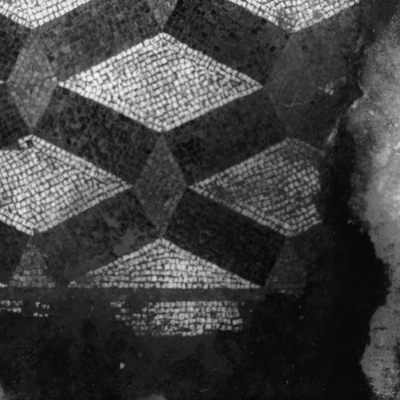 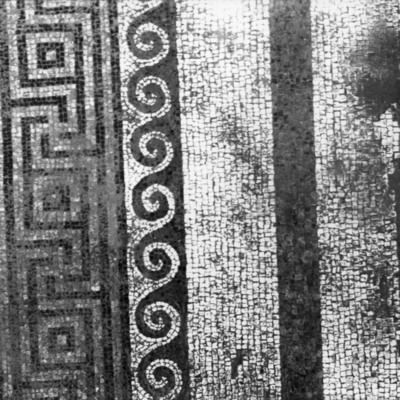 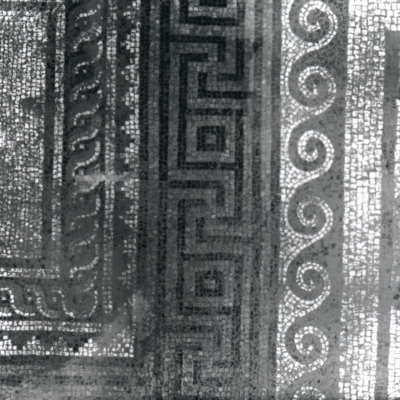 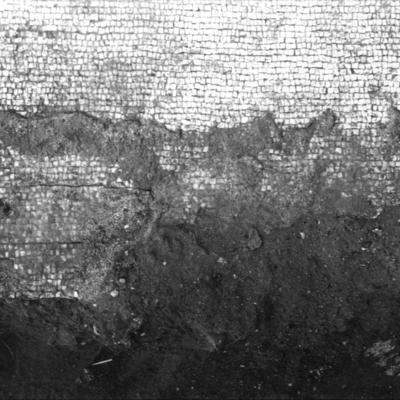 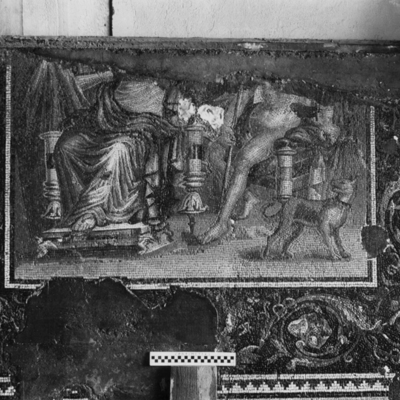 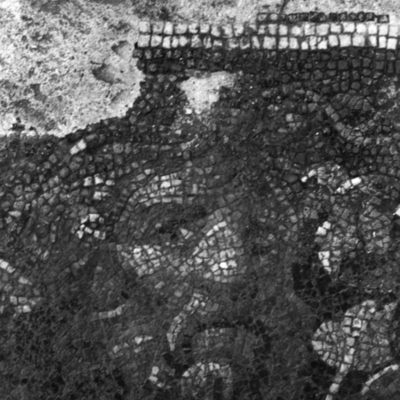 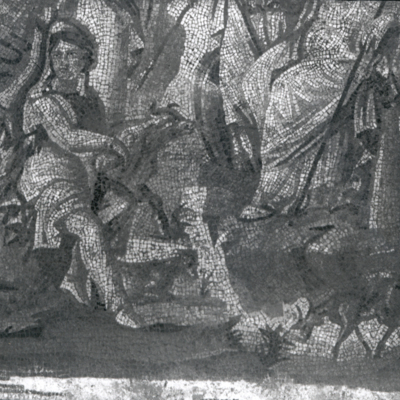 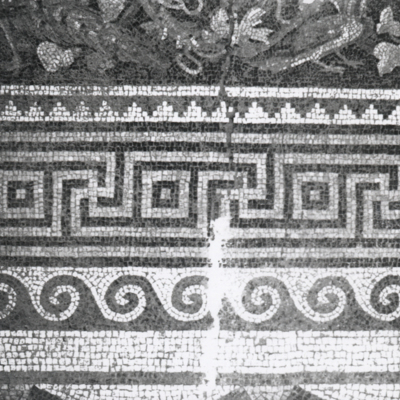 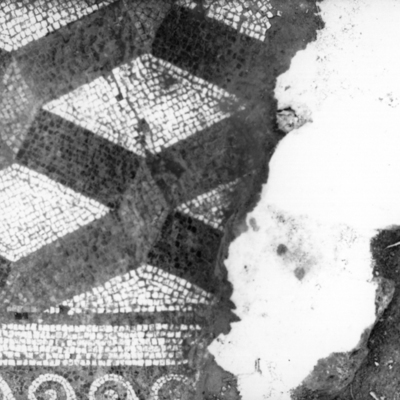 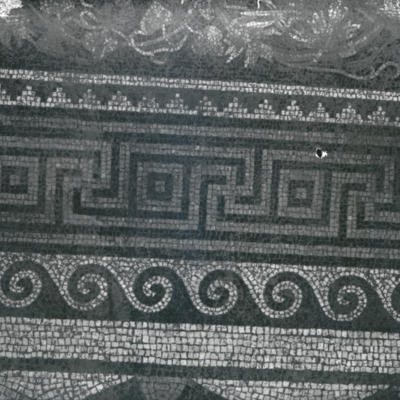 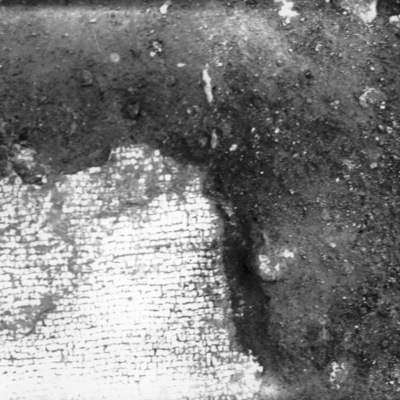 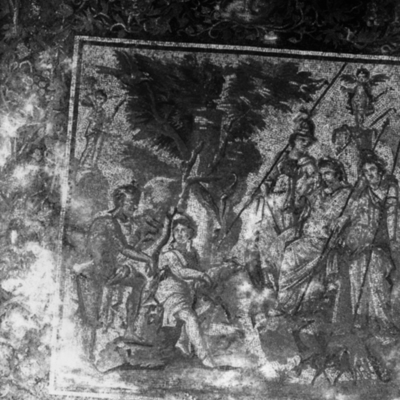 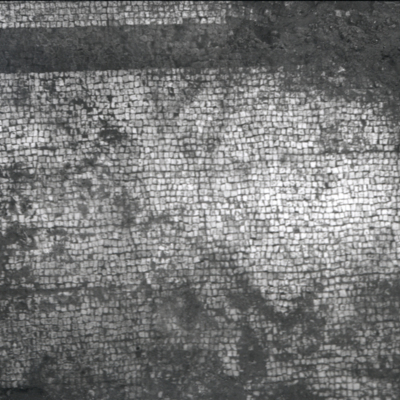 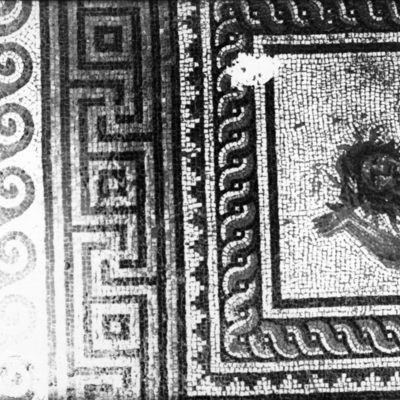 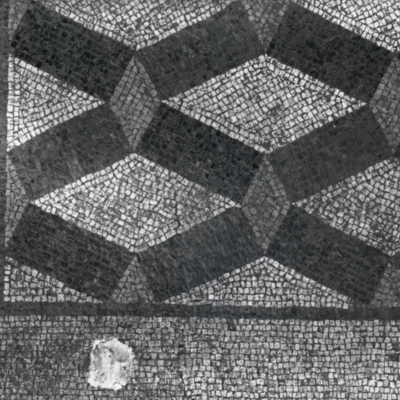 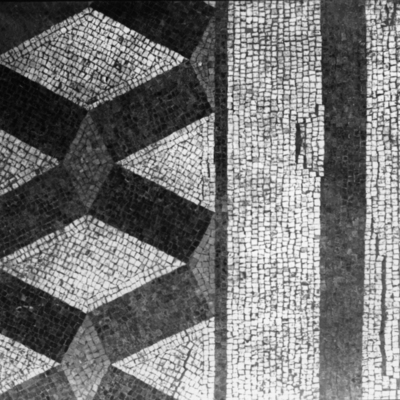 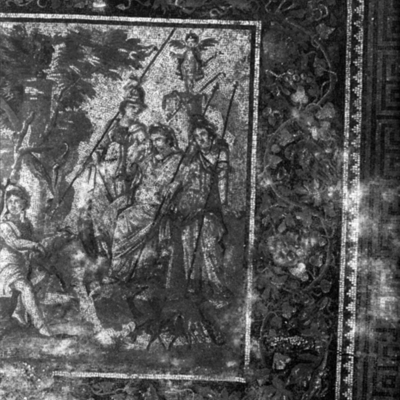 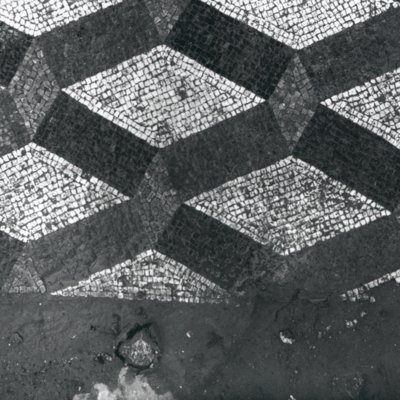 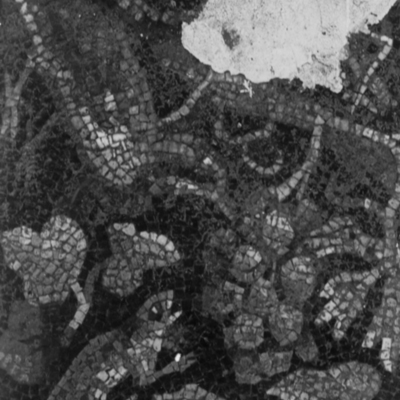 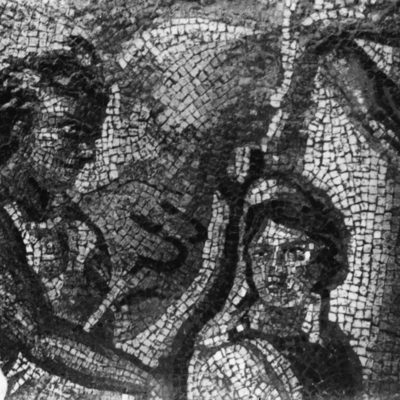 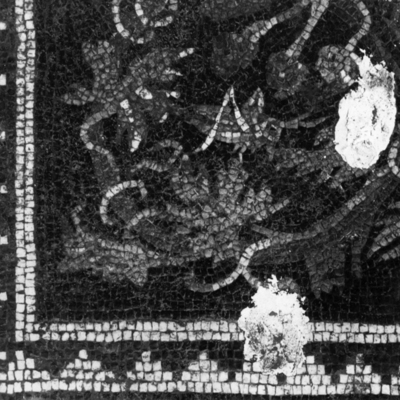 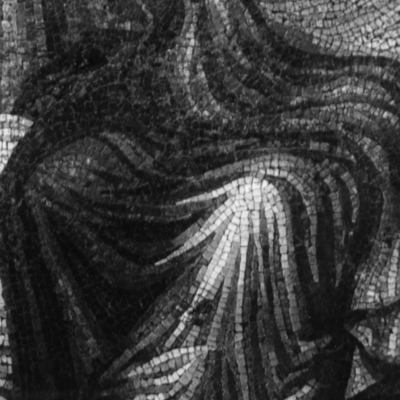 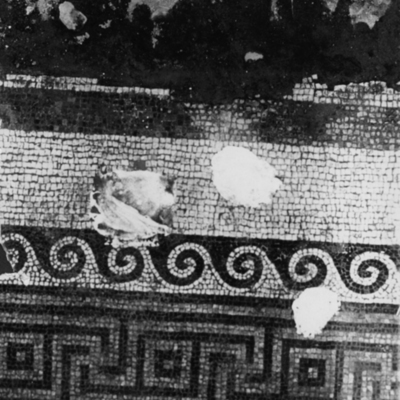 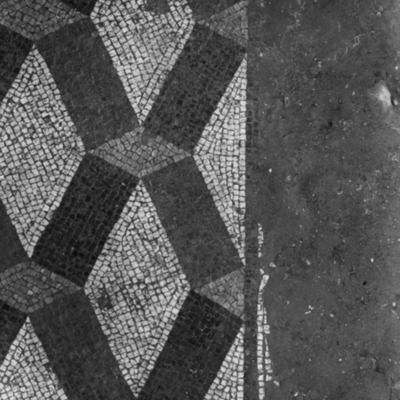 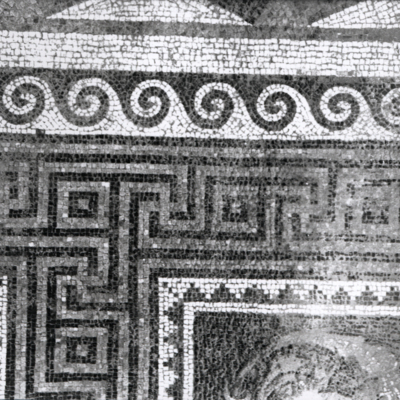 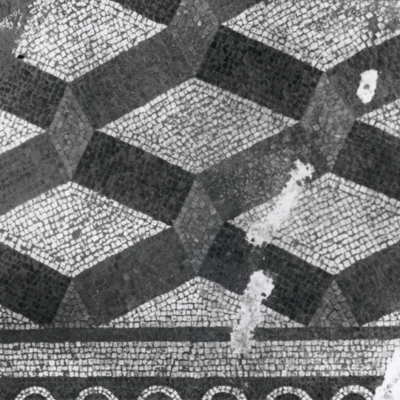 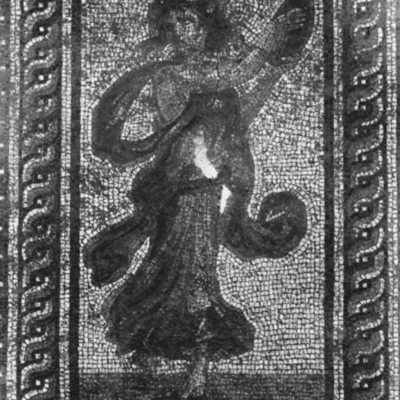 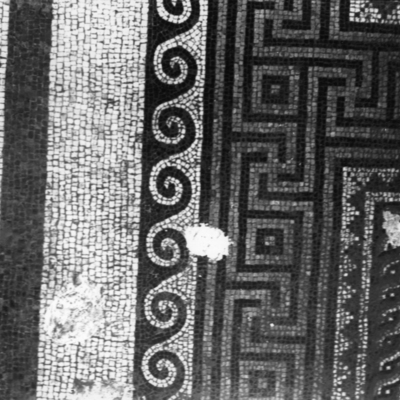 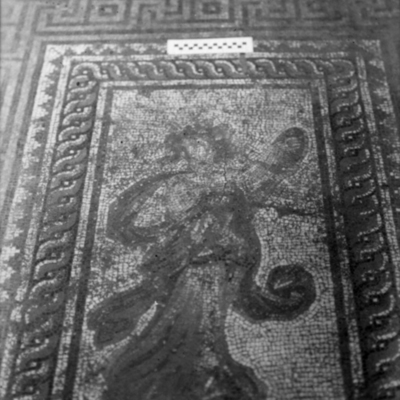 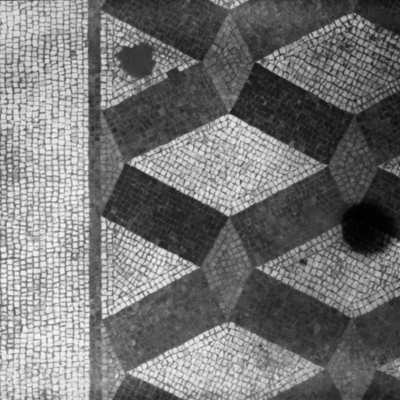 Section of mosaic after lifting. 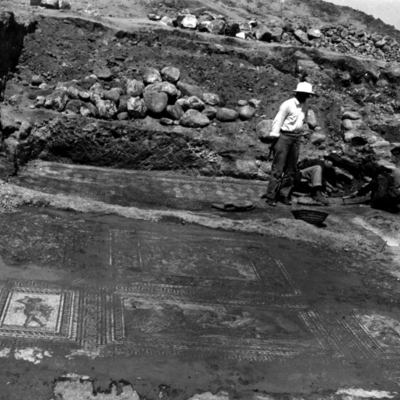 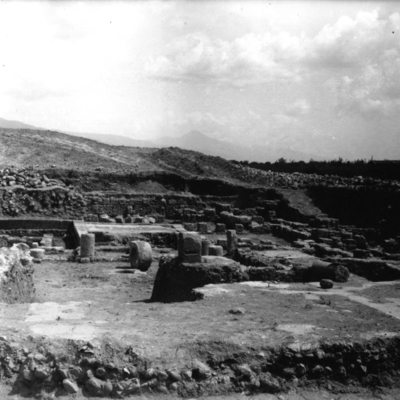 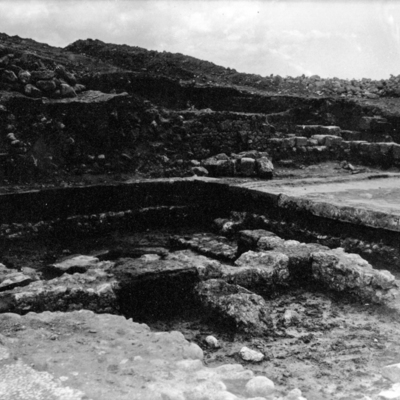 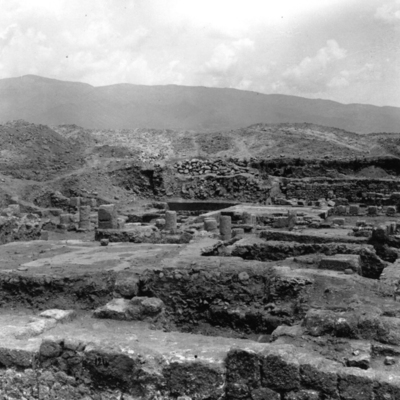 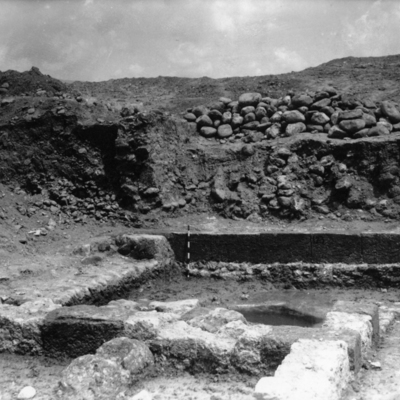 Large wall and mosaic in SE corner of excavations. 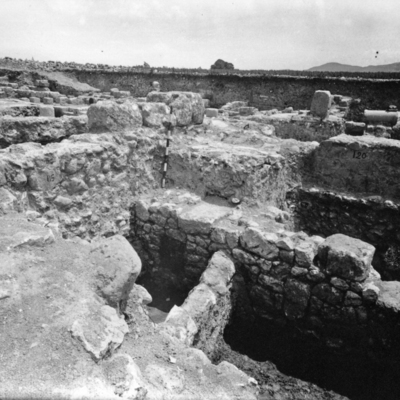 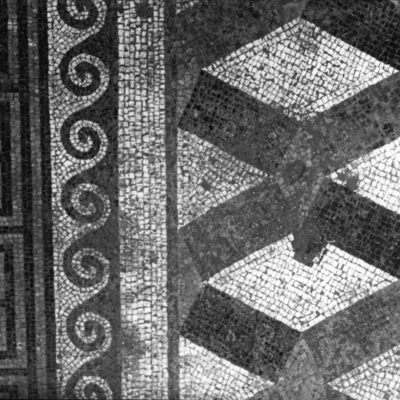 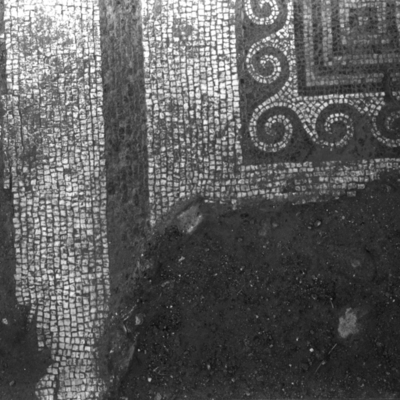 Older rooms under mosaic floor. 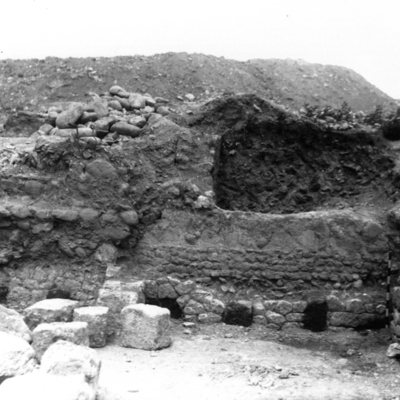 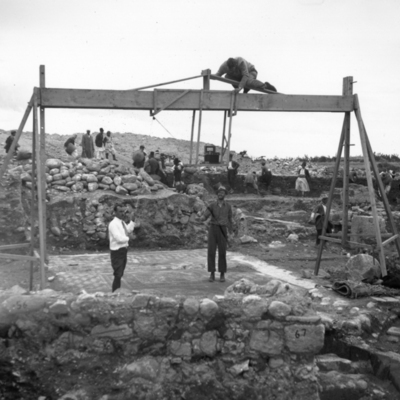 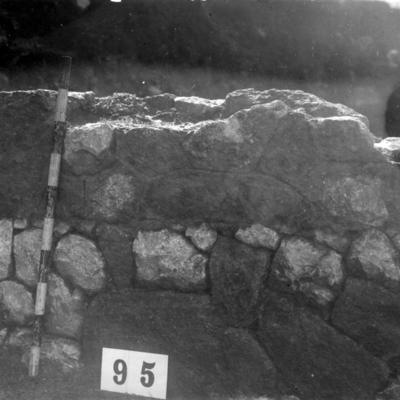 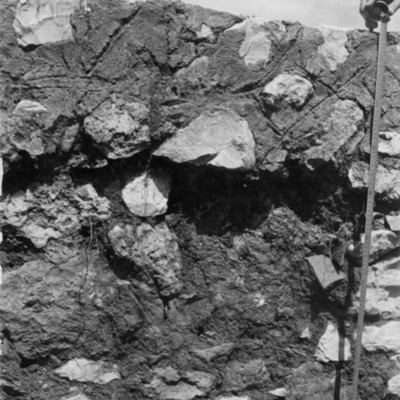 Detail of long wall in SE corner of excavations. 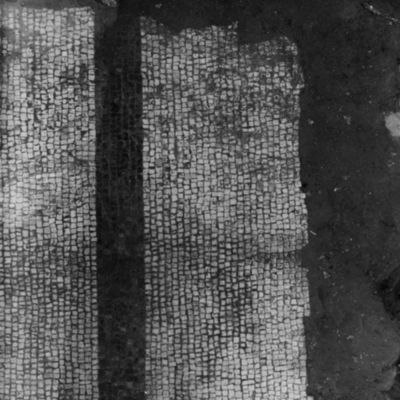 Entire pavement assembled from separate photographs. 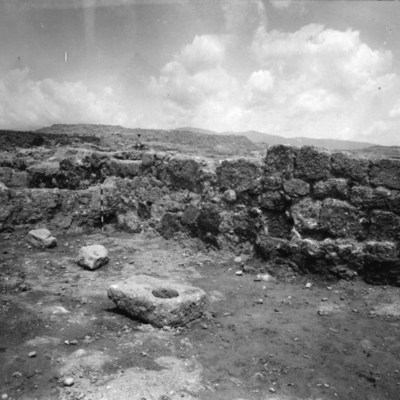 South face of north wall. 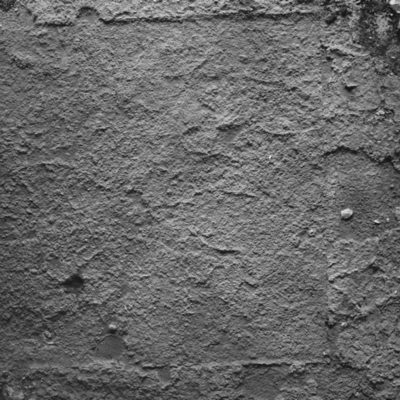 North face of south wall. 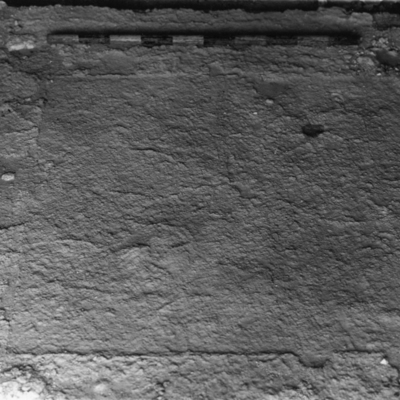 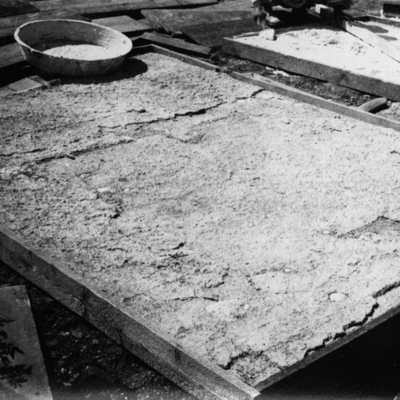 Back of panel D showing joint in plastering.